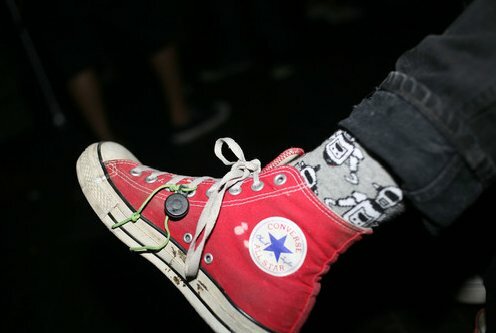 Photo gallery of various pairs of red high top chucks. 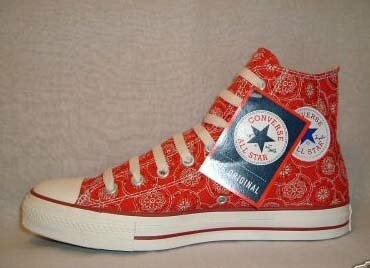 1 Red High Top Chucks Red bandana print high top. 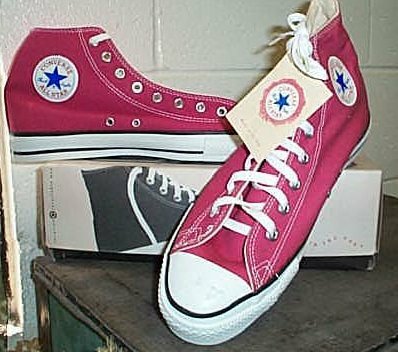 2 Red High Top Chucks New blush red high tops with original box. 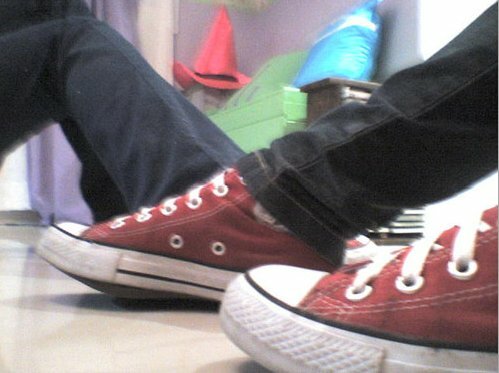 3 Red High Top Chucks Blush red high tops, side view. 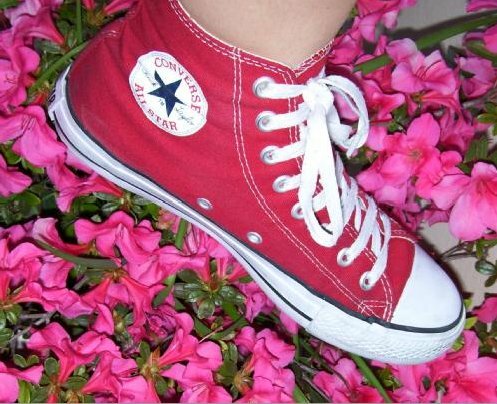 4 Red High Top Chucks Blush red high tops, side views. 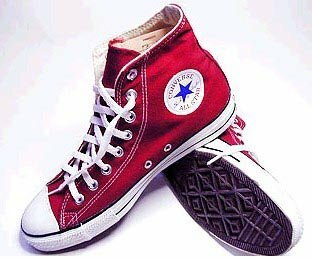 5 Red High Top Chucks Brick red high tops, outer sole and inside patch views. 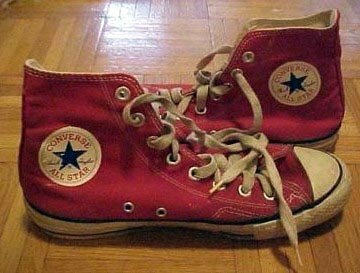 6 Red High Top Chucks Brick red high tops, inside patch and sole views. 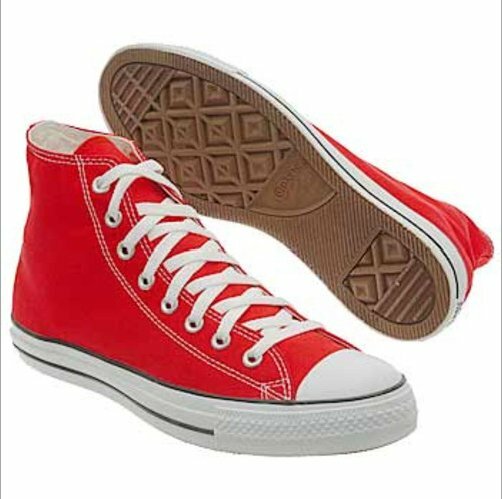 7 Red High Top Chucks Brick red high tops, front and rear views. 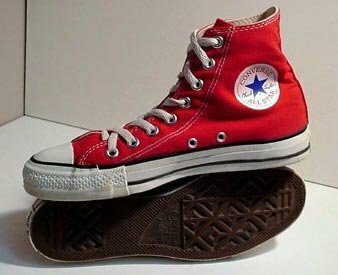 8 Red High Top Chucks Brick red high tops, angled front views. 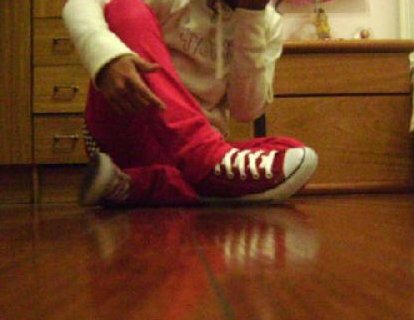 9 Red High Top Chucks Brick red high tops, outside views. 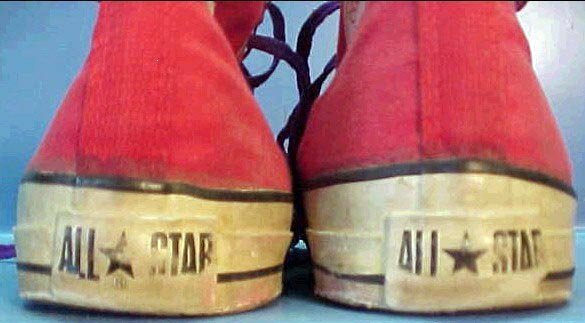 10 Red High Top Chucks Converse coach high top, inside patch view. 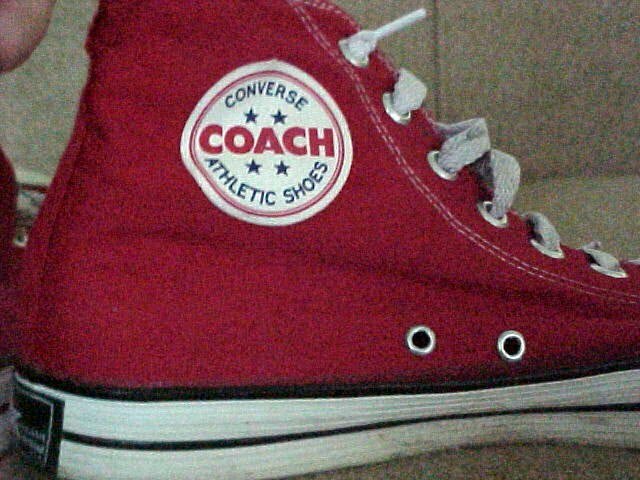 11 Red High Top Chucks Converse Coach high tops, rear patch and front views. 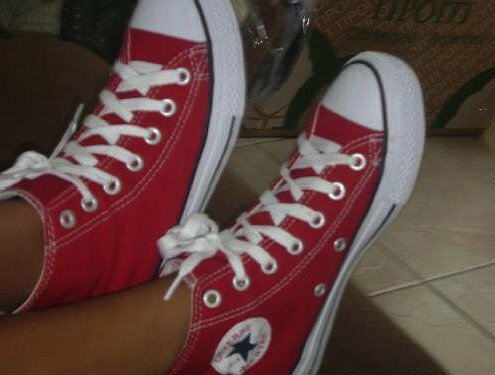 12 Red High Top Chucks Coated red high tops, side views. 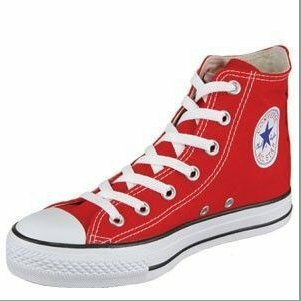 13 Red High Top Chucks Coated red high tops, front and rear views. 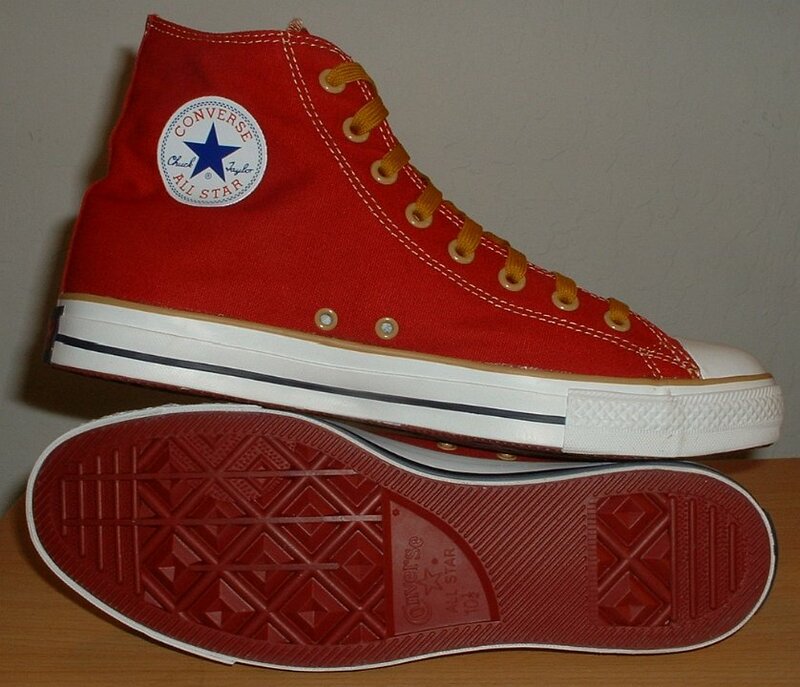 14 Red High Top Chucks Coated red high tops, angled sole and inside patch views. 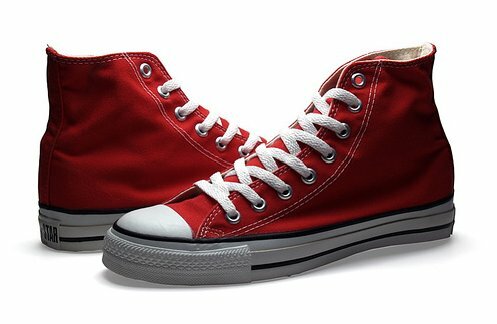 15 Red High Top Chucks Coated red high tops, angled front views. 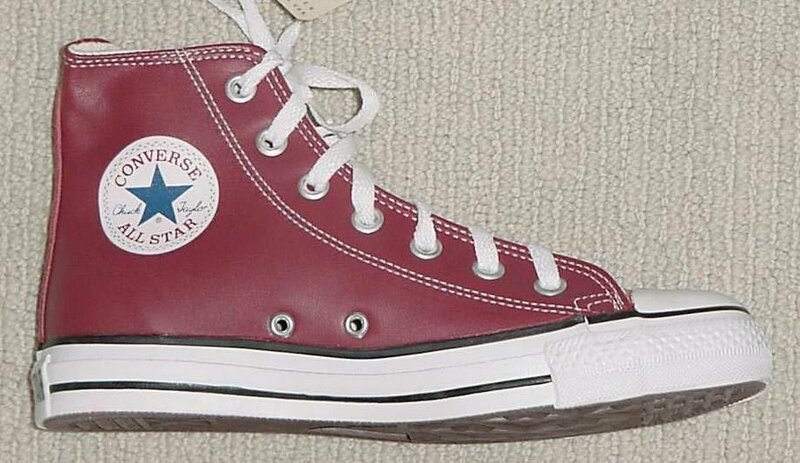 16 Red High Top Chucks Left coated red high top, inside patch view. 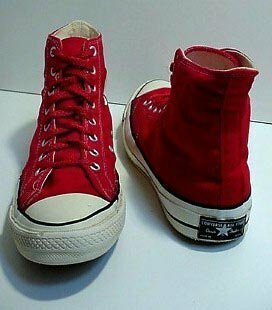 17 Red High Top Chucks Coated red high tops, angled inside patch views. 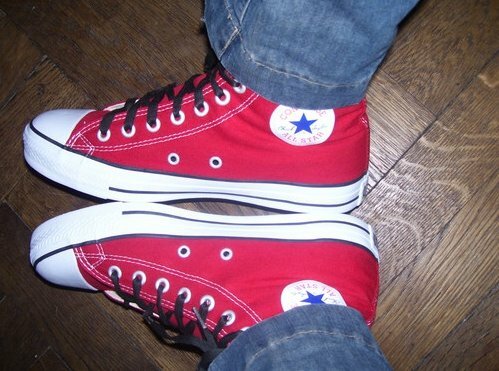 18 Red High Top Chucks Coated red high tops, top view. 19 Red High Top Chucks Decorated red high top, angled inside patch view. 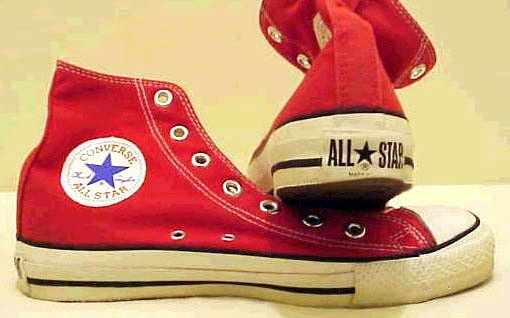 20 Red High Top Chucks Decorated red high tops, angled front view. 21 Red High Top Chucks Decorated red high top, inside patch view. 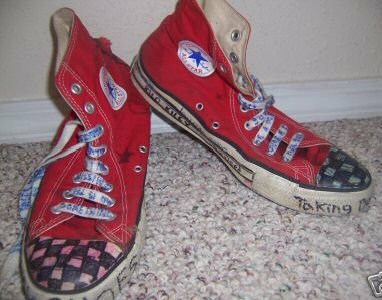 22 Red High Top Chucks Decorated red high tops, outside view. 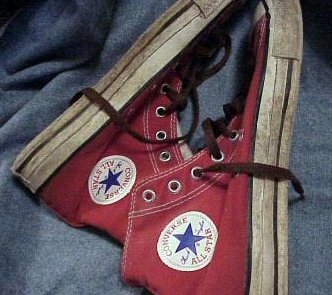 23 Red High Top Chucks Distressed red high tops, top view. 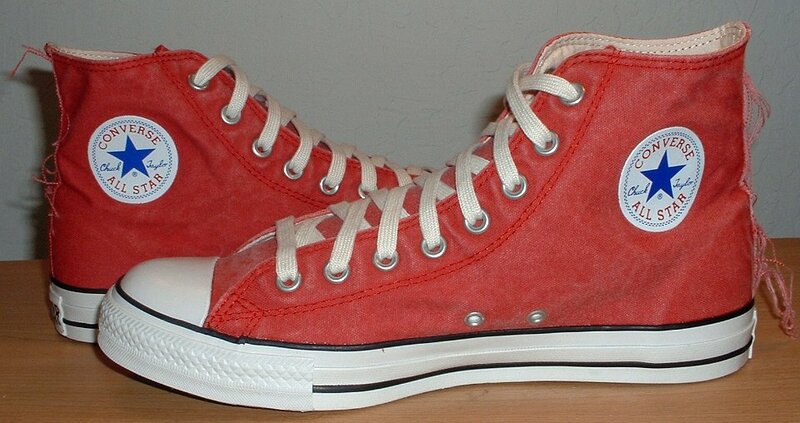 24 Red High Top Chucks Distressed red right high top, outside view. 25 Red High Top Chucks Distressed red righ high top, inside patch view. 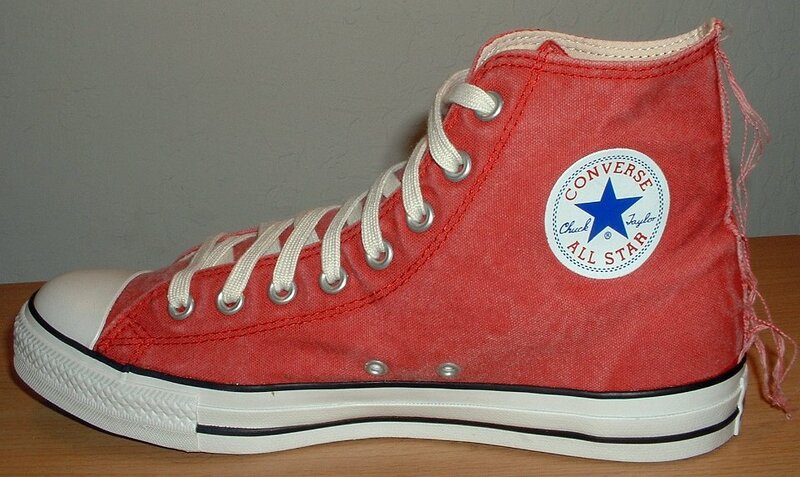 26 Red High Top Chucks Distressed red right high top, rear view. 27 Red High Top Chucks Distressed red left high top, inside patch view. 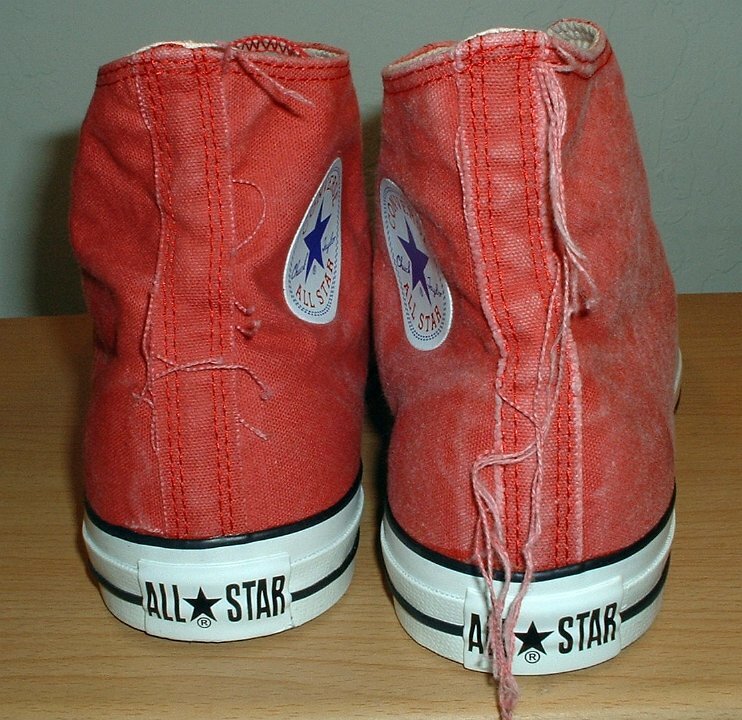 28 Red High Top Chucks Distressed red left high top, outside view. 29 Red High Top Chucks Front view of distressed red high tops. 30 Red High Top Chucks Rear view of distressed red high tops, showing their dangling threads. 31 Red High Top Chucks Distressed red high tops, inside patch view. 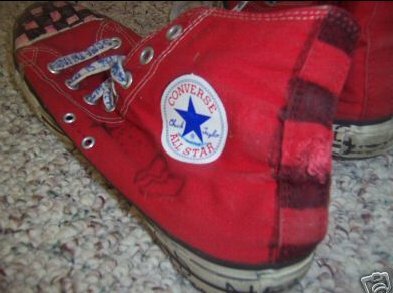 32 Red High Top Chucks Distressed red high tops, outside view. 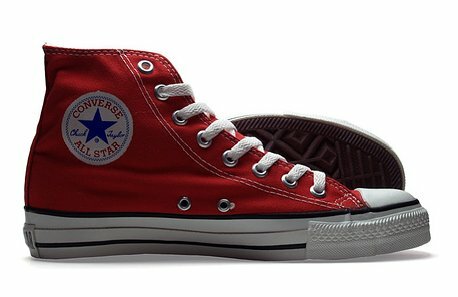 33 Red High Top Chucks Distressed red high tops, outer sole and inside patch views. 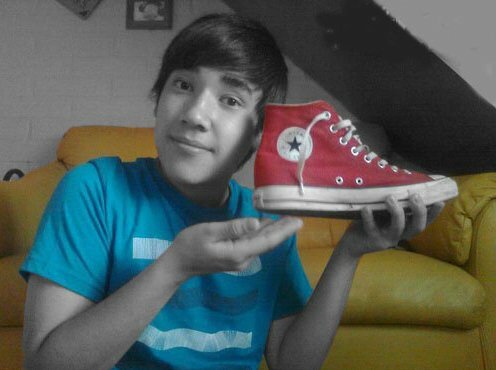 34 Red High Top Chucks Guy holding a pair of red high top chucks. 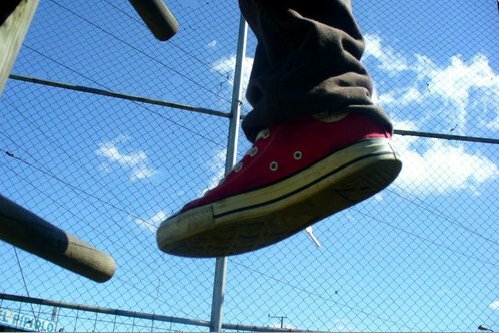 35 Red High Top Chucks Climbing in red high top chucks. 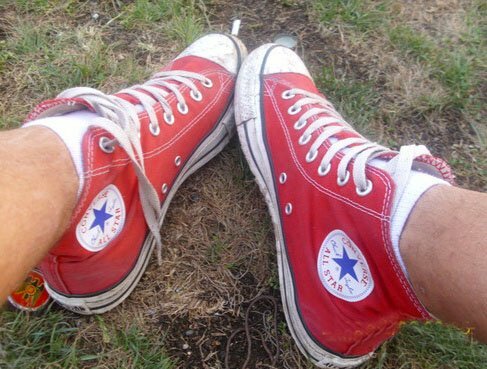 36 Red High Top Chucks Guy showing off his left high top chuck. 37 Red High Top Chucks nside patch view of a left picante red high top. 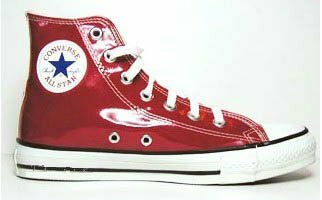 38 Red High Top Chucks Outside view of a left picante red high top. 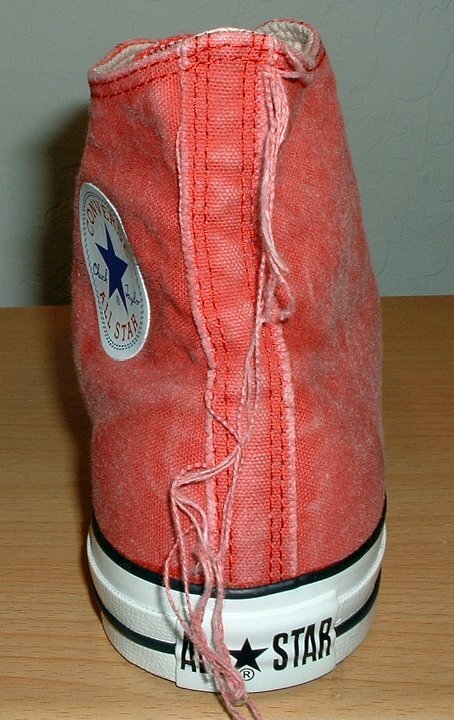 39 Red High Top Chucks Inside patch view of a right picante red high top. 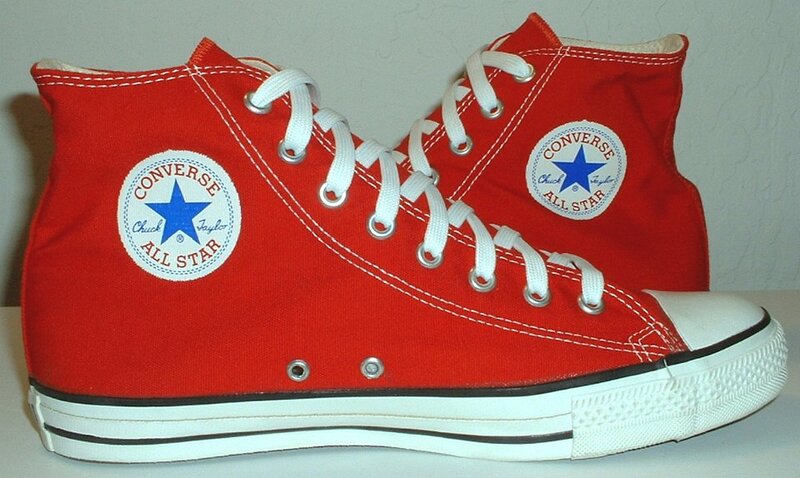 40 Red High Top Chucks Outside view of a right picante red high top. 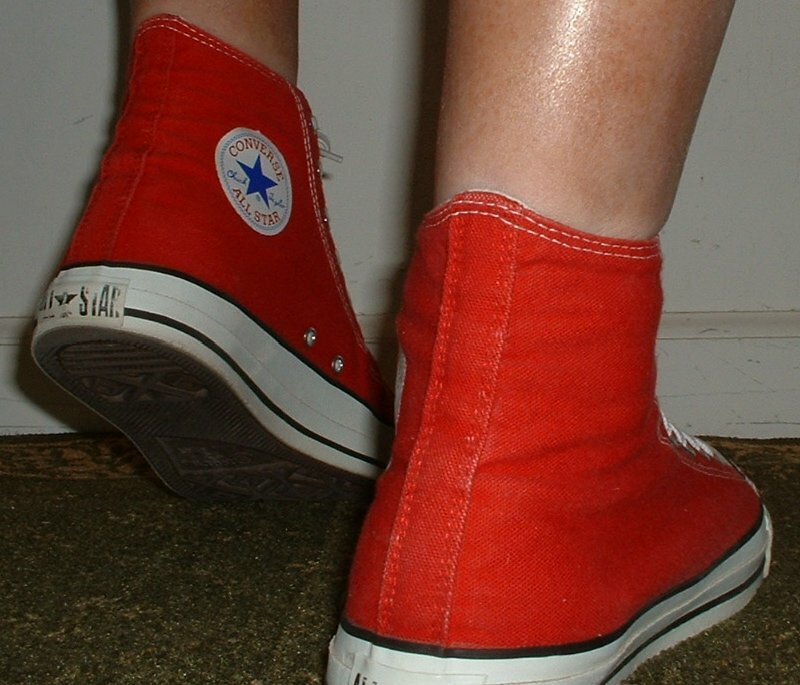 41 Red High Top Chucks Rear view of picante red high tops. 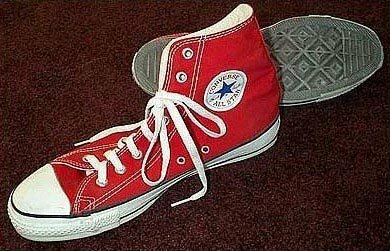 42 Red High Top Chucks Front view of picante red high tops. 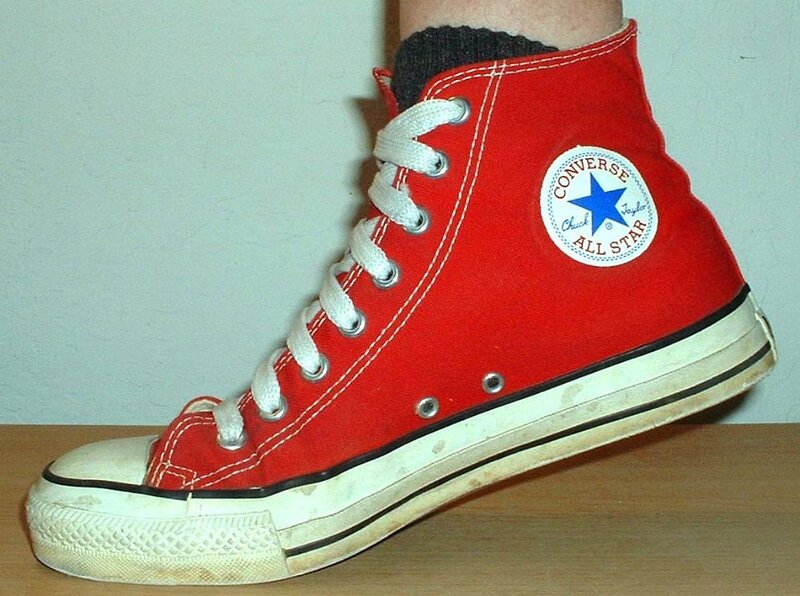 43 Red High Top Chucks Angled side view of picante red high tops. 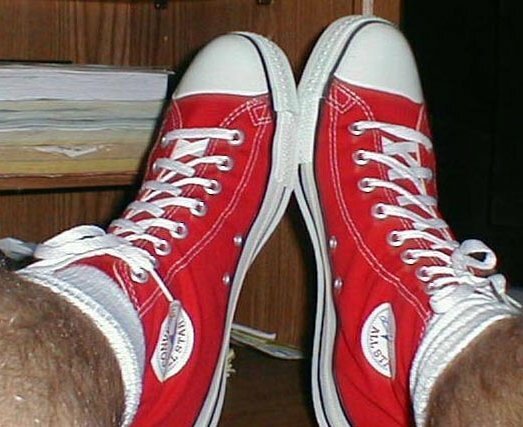 44 Red High Top Chucks Top view of picante red high tops. 45 Red High Top Chucks Angled inside patch view of picante red high tops. 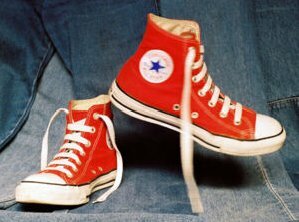 46 Red High Top Chucks Inside patch views of picante red high tops. 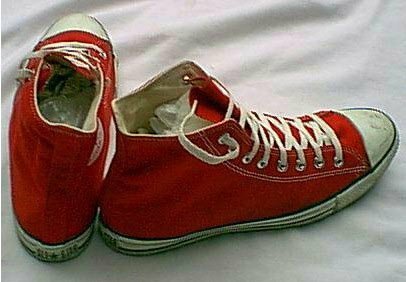 47 Red High Top Chucks Inside patch and sole views of picante red high tops. 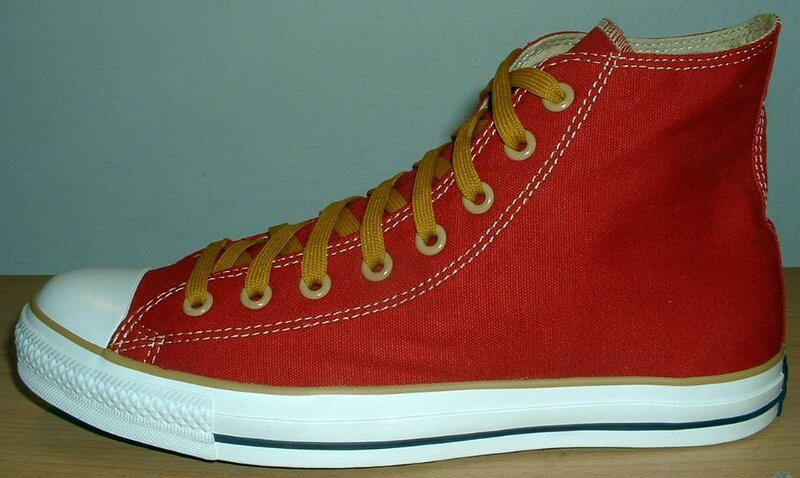 48 Red High Top Chucks Inside patch view of a right red and gold foldover high top with gold laces. 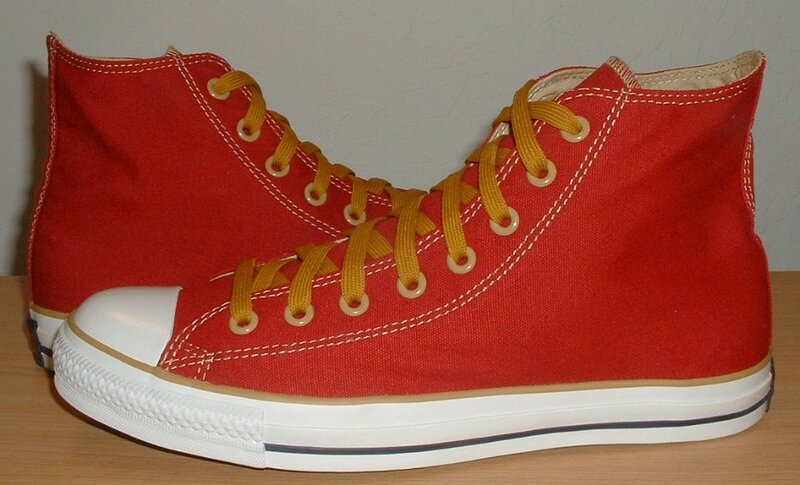 49 Red High Top Chucks Outside view of a right red and gold foldover high top with gold laces. 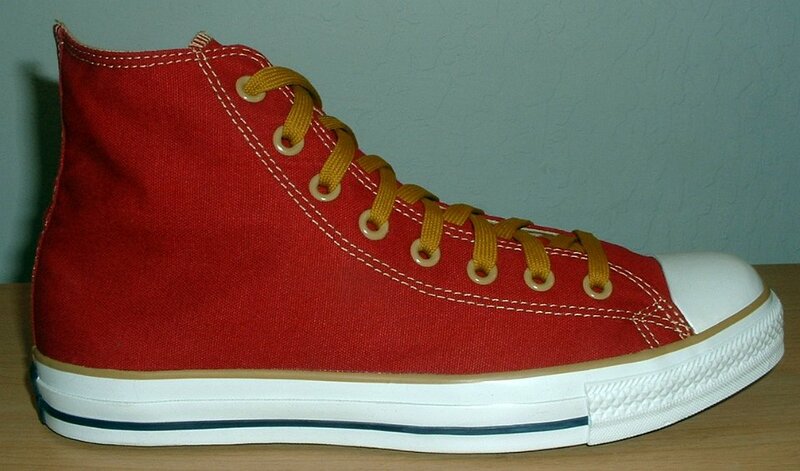 50 Red High Top Chucks Inside patch view of a left red and gold foldover high top with gold laces. 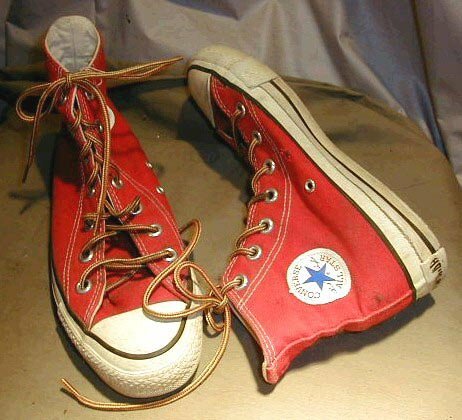 51 Red High Top Chucks Outside view of a left red and gold foldover high top chuck. 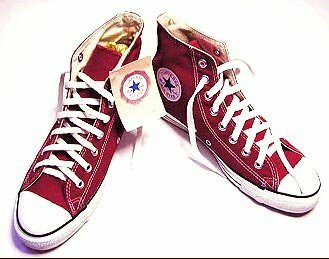 52 Red High Top Chucks Outside views of red and gold foldover high tops with gold laces. 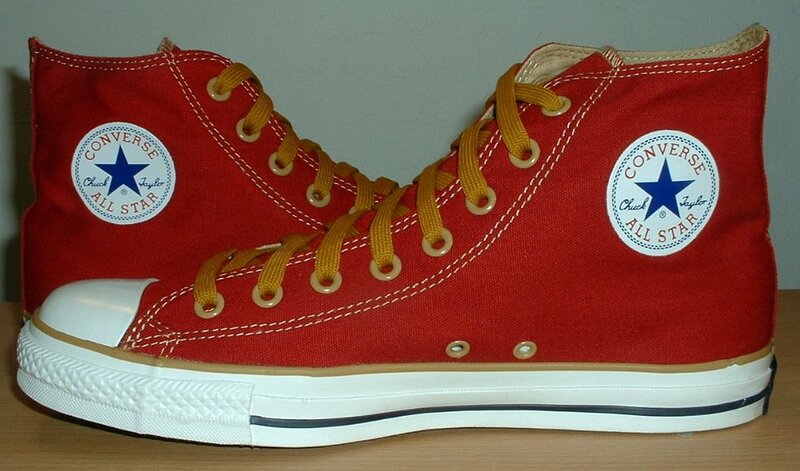 53 Red High Top Chucks Inside patch views of red and gold foldover high tops with gold laces. 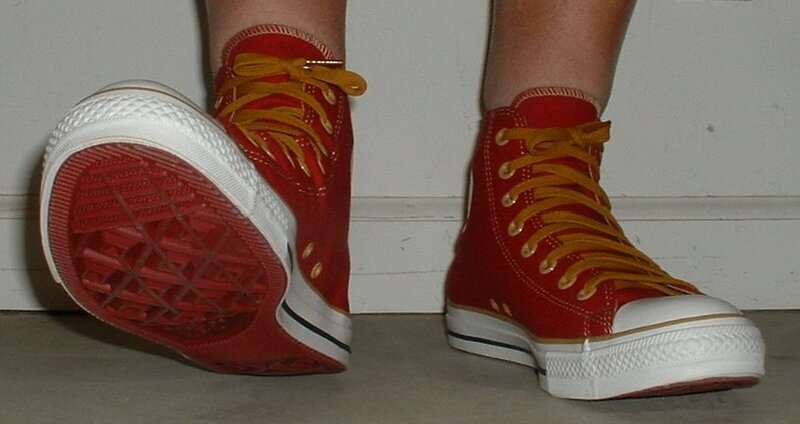 54 Red High Top Chucks Rear view of red and gold foldover high tops with gold laces. 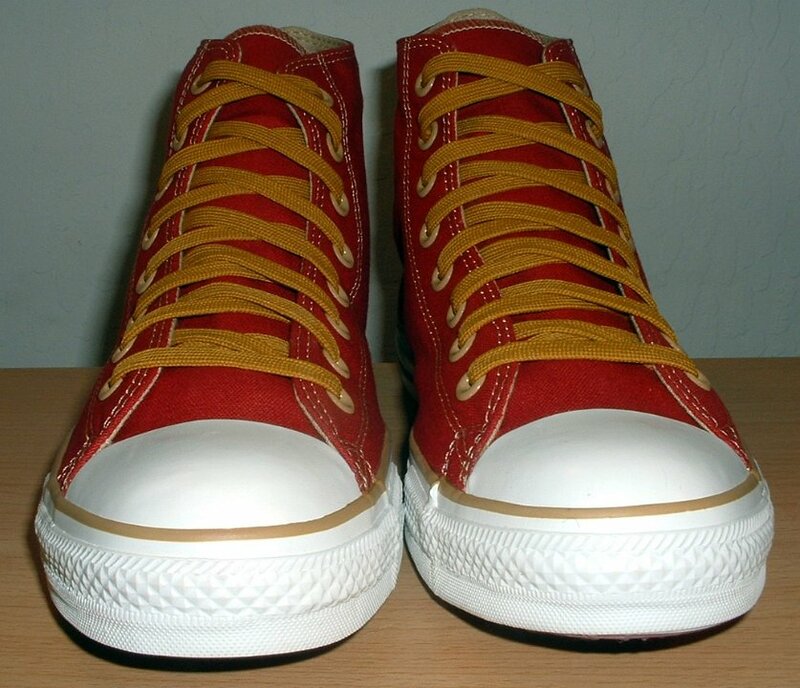 55 Red High Top Chucks Top view of red and gold foldover high tops with gold laces. 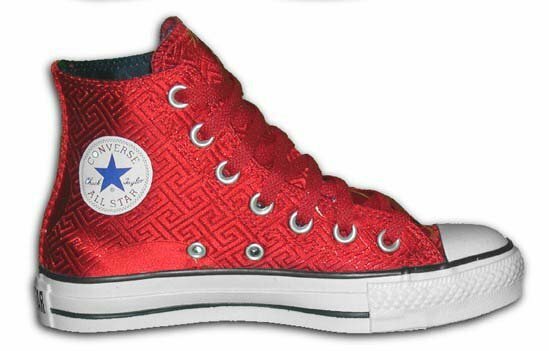 56 Red High Top Chucks Front view of red and gold foldover high tops with gold laces. 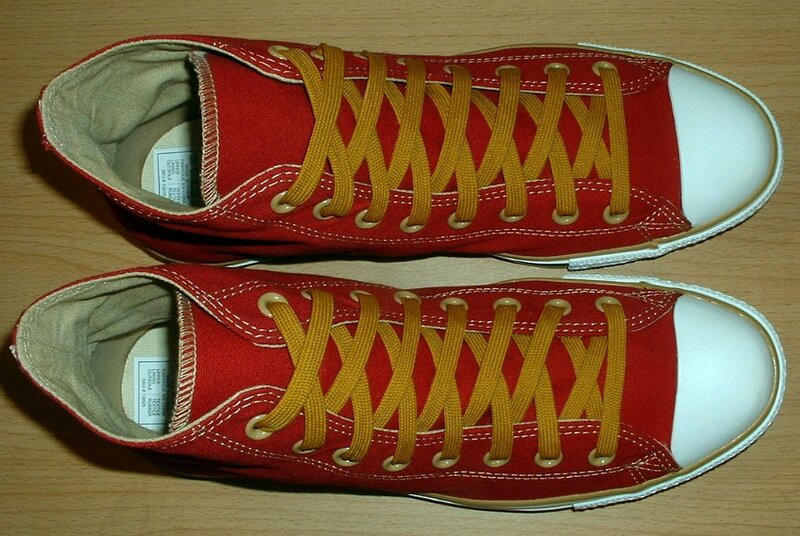 57 Red High Top Chucks Angled front view of red and gold foldover high tops with gold laces. 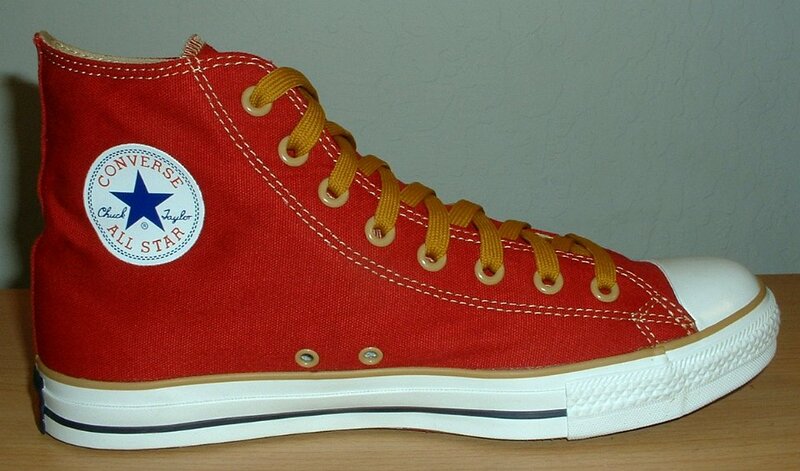 58 Red High Top Chucks Inside patch and sole views of red and gold foldover high tops with gold laces. 59 Red High Top Chucks Classic red left high top, inside patch view. 60 Red High Top Chucks Inside patch view of a right made in USA red high top. 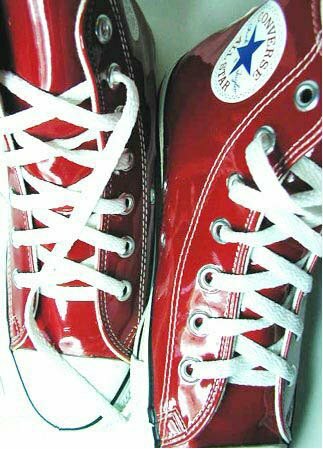 61 Red High Top Chucks Outside view of a right made in USA red high top. 62 Red High Top Chucks Inside patch view of a left made in USA red high top. 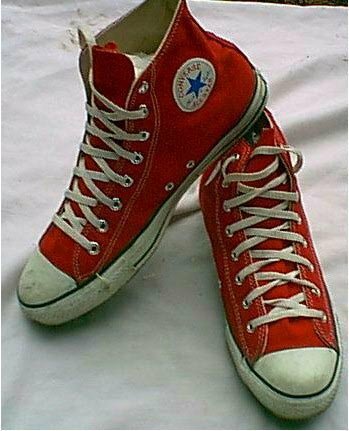 63 Red High Top Chucks Outside view of a left made in USA red high top. 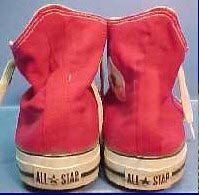 64 Red High Top Chucks Rear view of made in USA red high tops. 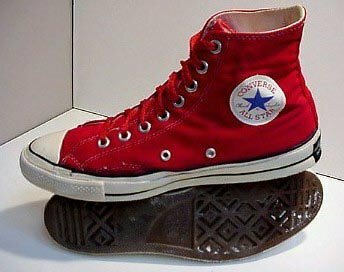 65 Red High Top Chucks Angled side view of made in USA red high tops. 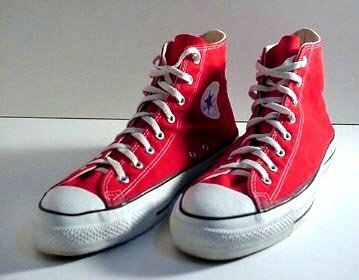 66 Red High Top Chucks Front view of made in USA red high tops. 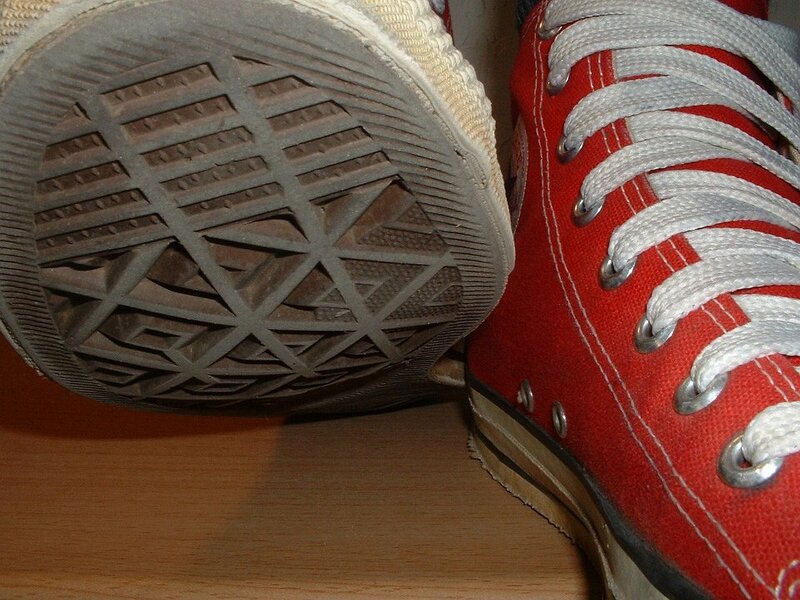 67 Red High Top Chucks Top view of made in USA red high tops. 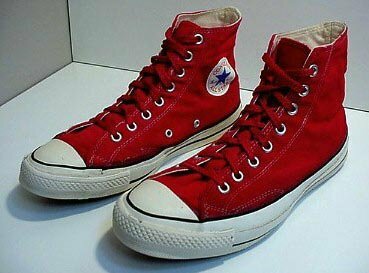 68 Red High Top Chucks inside patch views of made in USA red high tops. 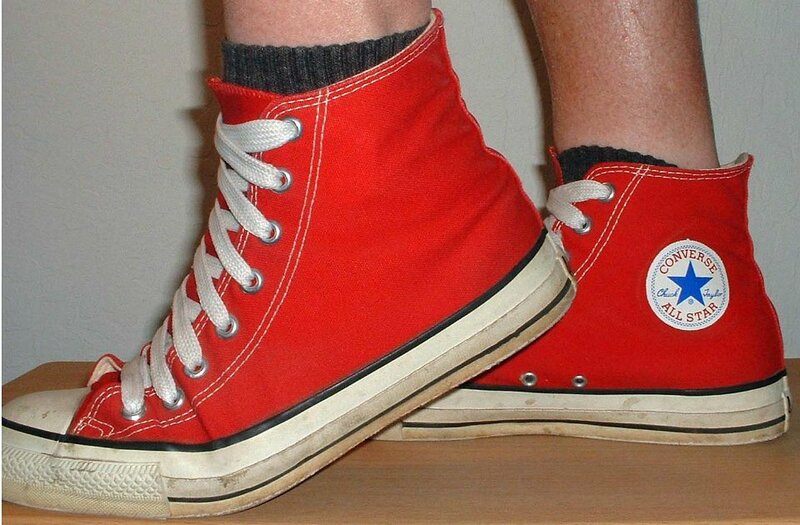 69 Red High Top Chucks Angled front view of made in USA red high tops. 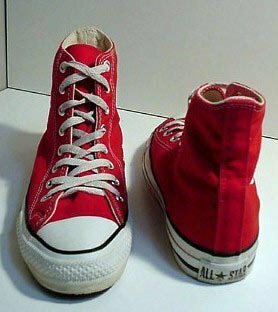 70 Red High Top Chucks Worn red high tops with black laces, inside patch views. 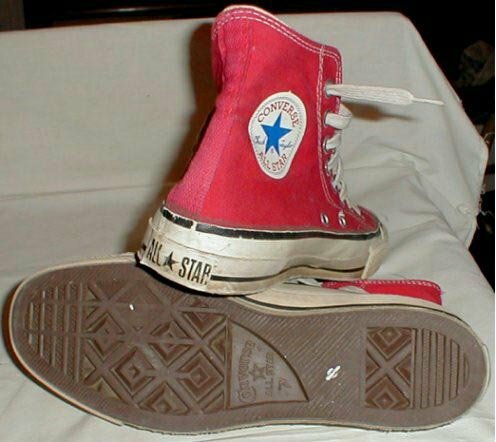 71 Red High Top Chucks Inside patch and partial sole view of red high top chucks. 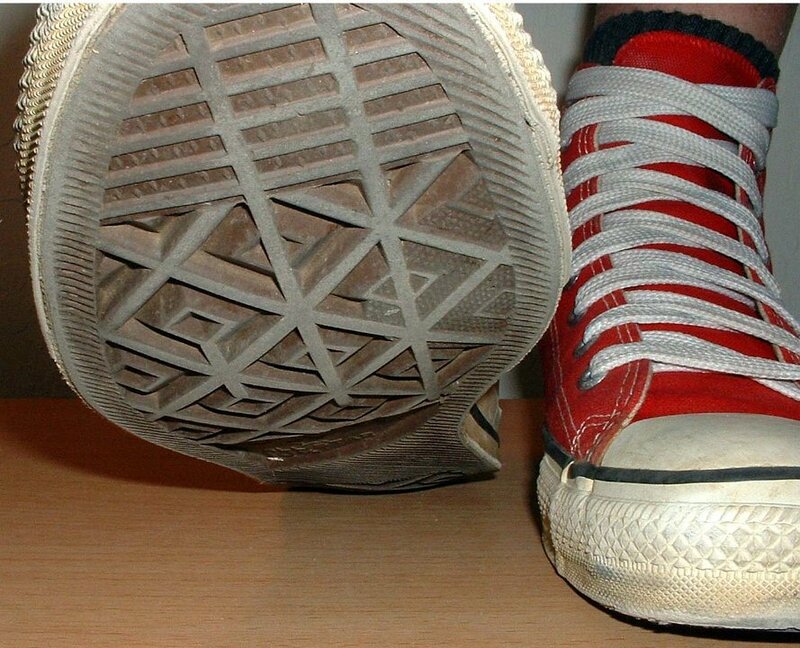 72 Red High Top Chucks Inside patch and partial sole view of red high top chucks. 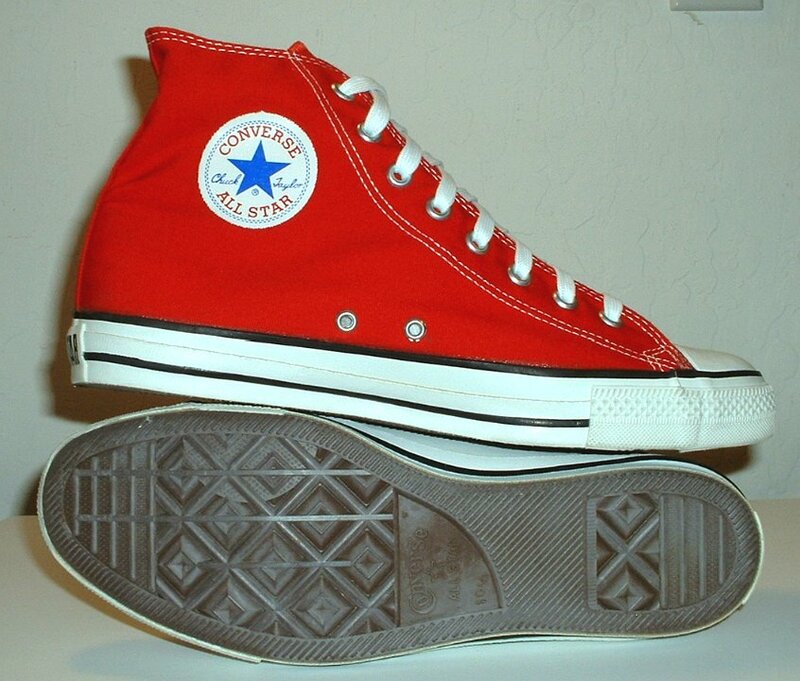 73 Red High Top Chucks Inside patch and sole views of made in USA red high tops. 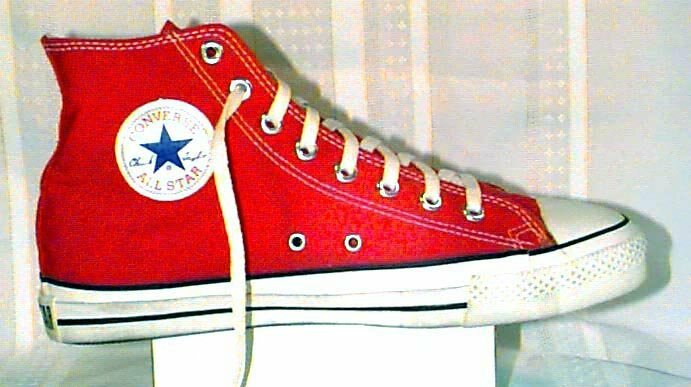 74 Red High Top Chucks New left red high top with box, partial inside patch view. 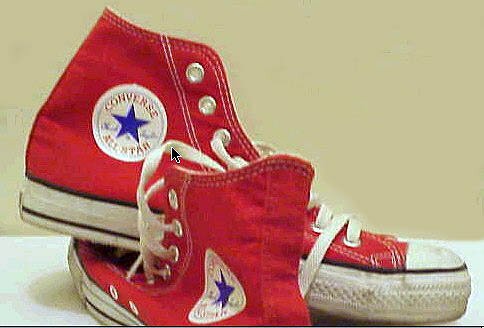 75 Red High Top Chucks Red high tops shown in an angled side view. 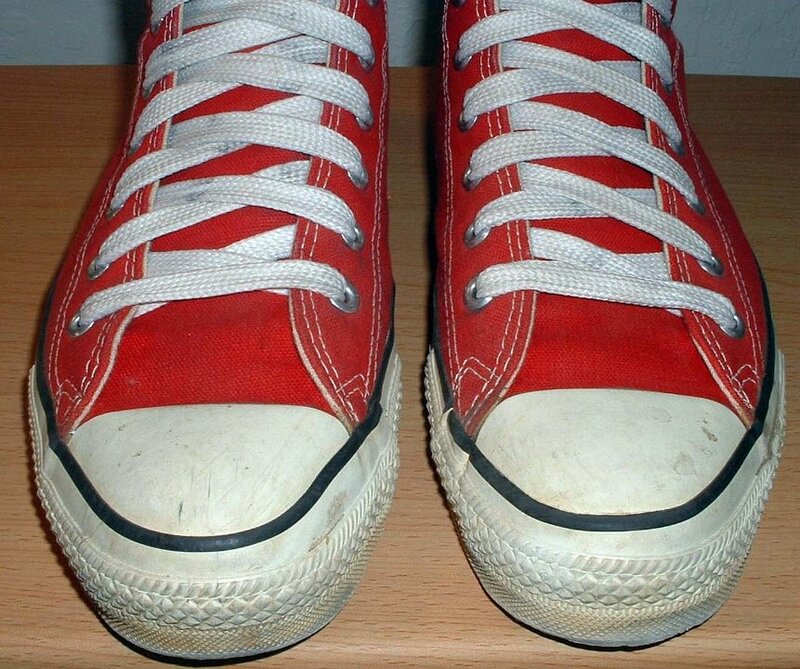 76 Red High Top Chucks Lightly worn red high tops without laces, inside patch and rear views. 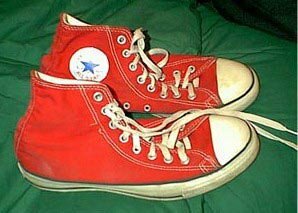 77 Red High Top Chucks Partially laced lightly worn red high tops, inside patch views. 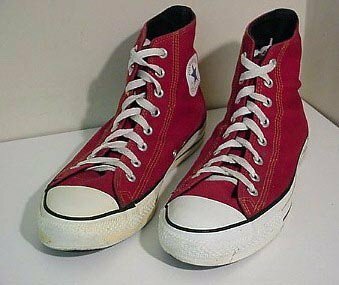 78 Red High Top Chucks Red high tops, angled inside patch views. 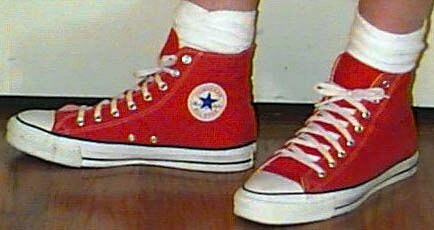 79 Red High Top Chucks Red high tops, angled inside patch views. 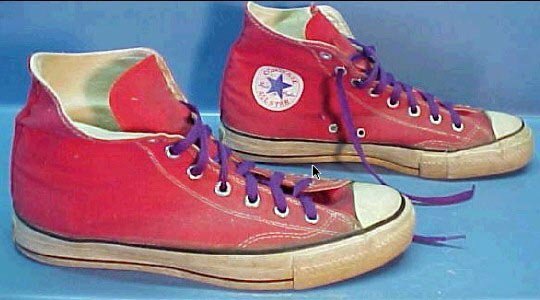 80 Red High Top Chucks Worn vintage red high tops with purple laces, rear patch view. 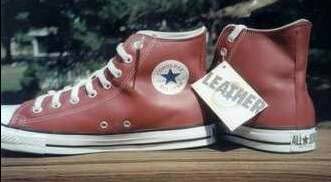 81 Red High Top Chucks Red left high top, inside patch view. 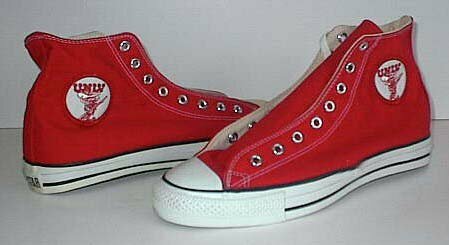 82 Red High Top Chucks Red high tops, made in USA, inside patch and angled rear views. 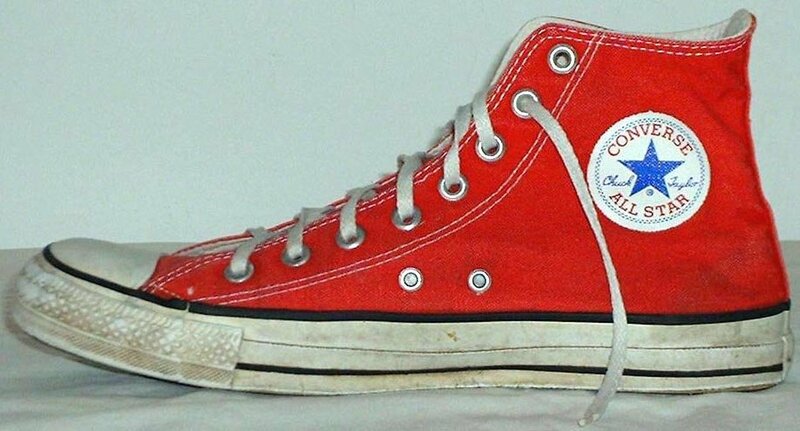 83 Red High Top Chucks Red high tops, inside patch and outer sole views. 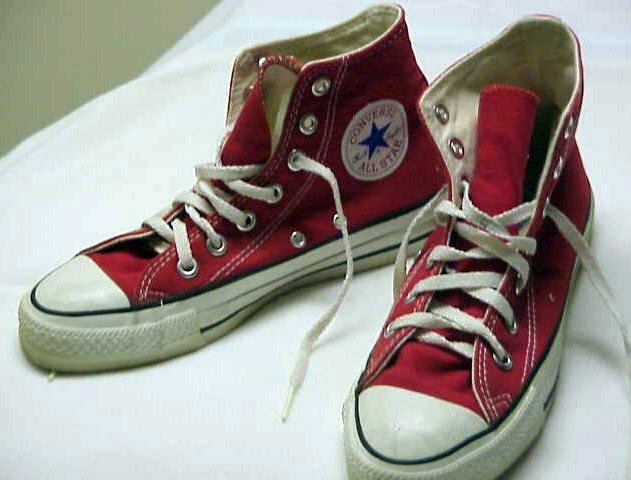 84 Red High Top Chucks Red high tops, angled front view. 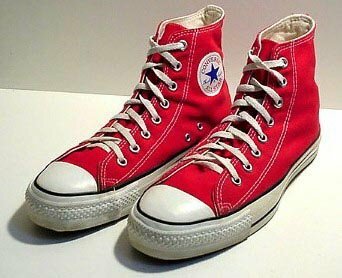 85 Red High Top Chucks Red high tops, angled front and rear views. 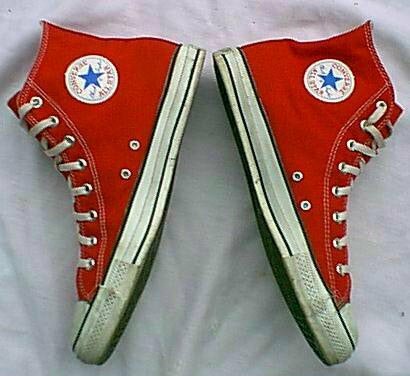 86 Red High Top Chucks Red high tops, inside patch and outersole view. 87 Red High Top Chucks Red right high top, inside patch view. 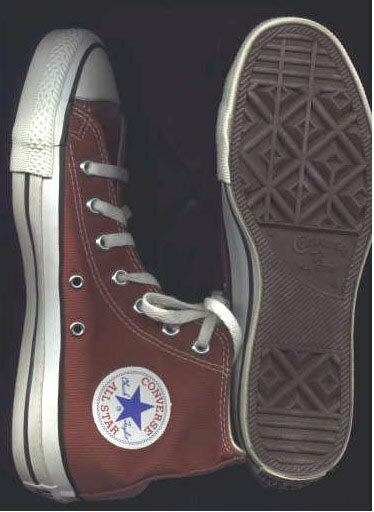 88 Red High Top Chucks Inside patch view of a left red high top chuck. 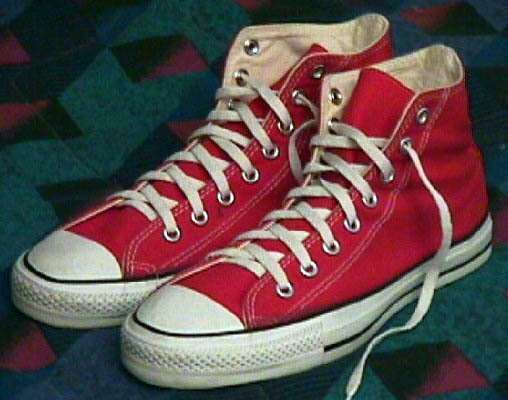 89 Red High Top Chucks Red high tops, angled front view. 90 Red High Top Chucks Classic red left high top, inside patch view. 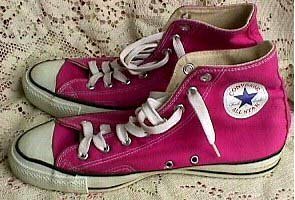 91 Red High Top Chucks Worn vintage red high tops with purple laces, outside and inside patch views. 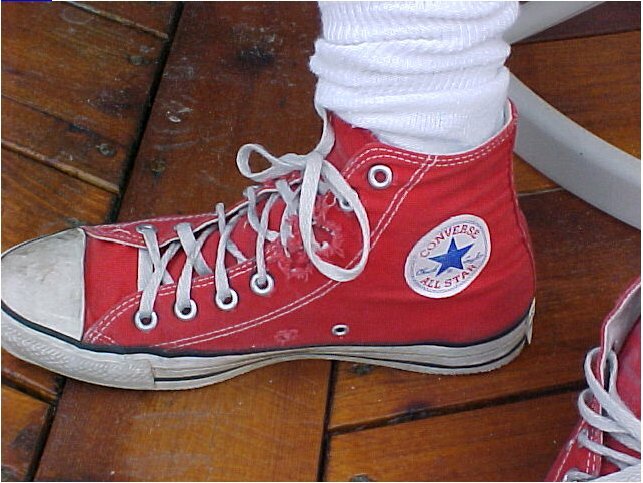 92 Red High Top Chucks Vintage red high tops, angled rear view. 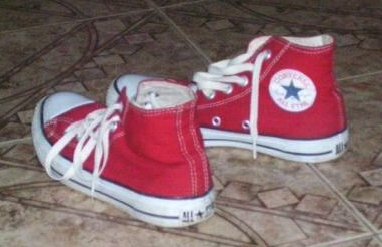 93 Red High Top Chucks Red high tops, top and side views. 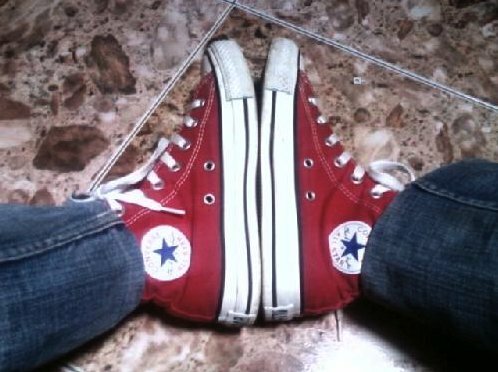 94 Red High Top Chucks Red high tops, angled side and top views. 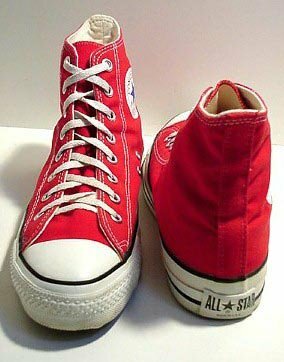 95 Red High Top Chucks Red high tops, front and rear views. 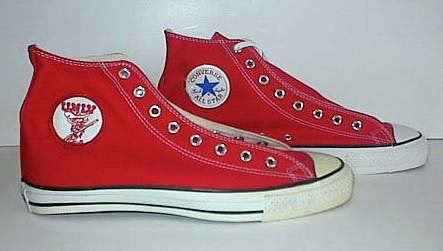 96 Red High Top Chucks Red high tops, inside patch and outer sole views. 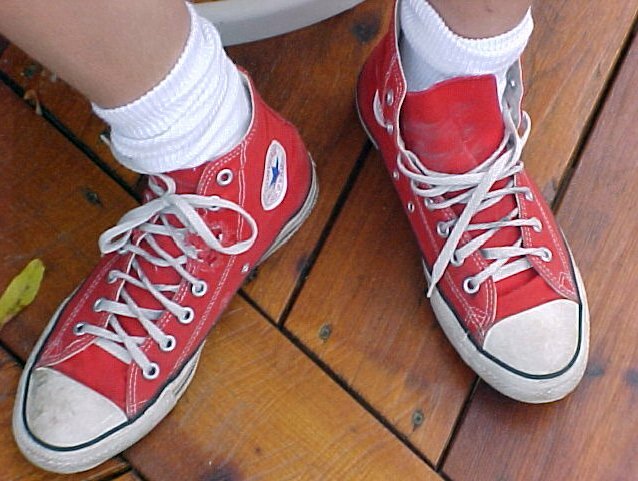 97 Red High Top Chucks Vintage red high tops with red laces, angled top and side views. 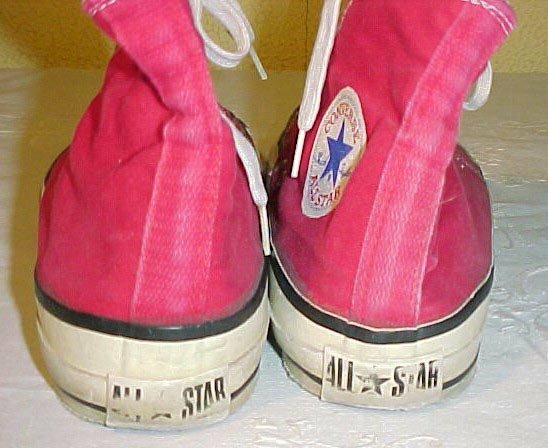 98 Red High Top Chucks Vintage red high tops with red laces, front and rear patch view showing black heel label. 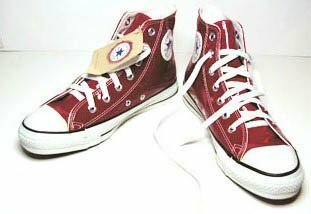 99 Red High Top Chucks Vintage red high tops with red laces, inside patch and outer sole views. 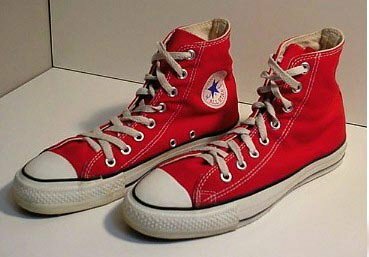 100 Red High Top Chucks Worn vintage red high tops, angled side views. 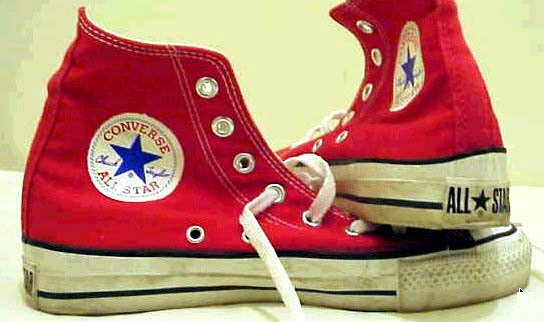 101 Red High Top Chucks Vintage red high tops, top front view. 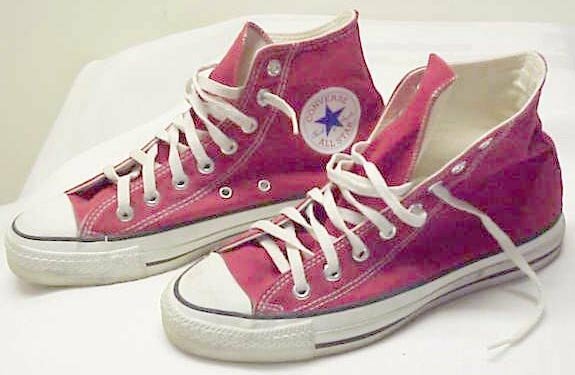 102 Red High Top Chucks Vintage red high tops, rear view. 103 Red High Top Chucks New red high tops with tag from the 1990s, angled front and top view. 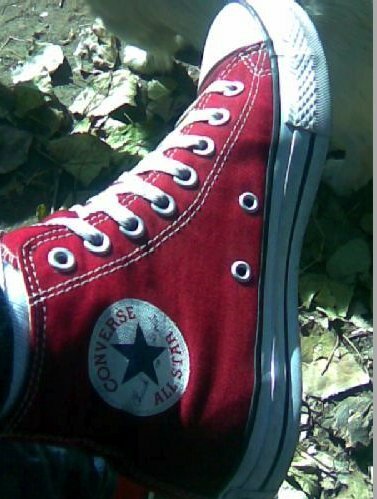 104 Red High Top Chucks Closeup of a new left red high top showing the ankle patch. 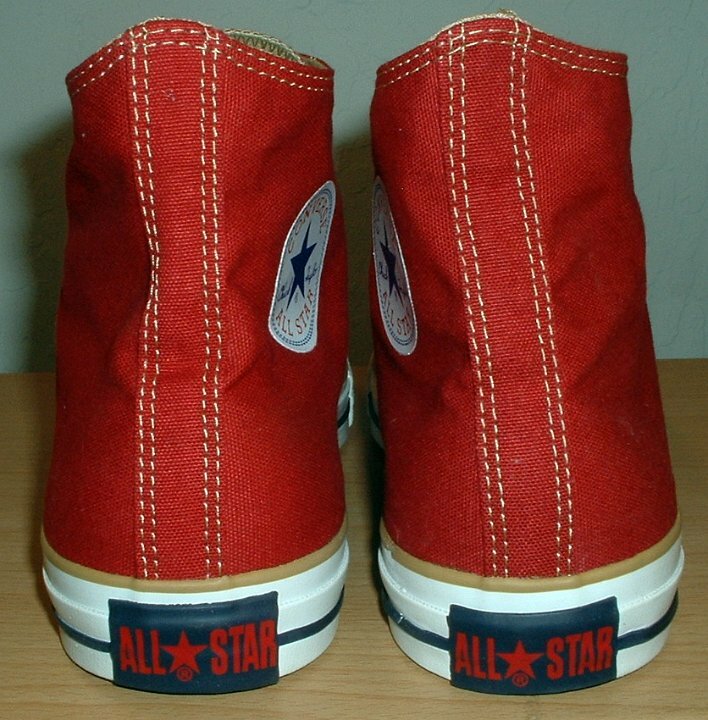 105 Red High Top Chucks Red high tops showing angled inside patch and partial sole views. 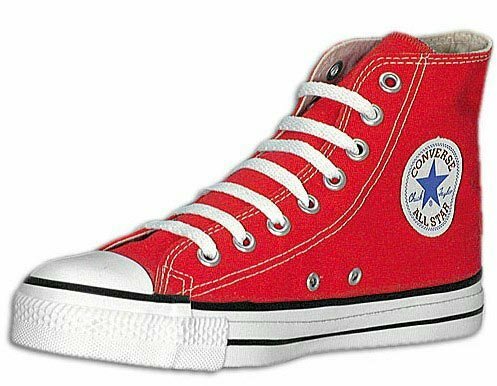 106 Red High Top Chucks Red high tops with rawhide laces, front and inside patch views. 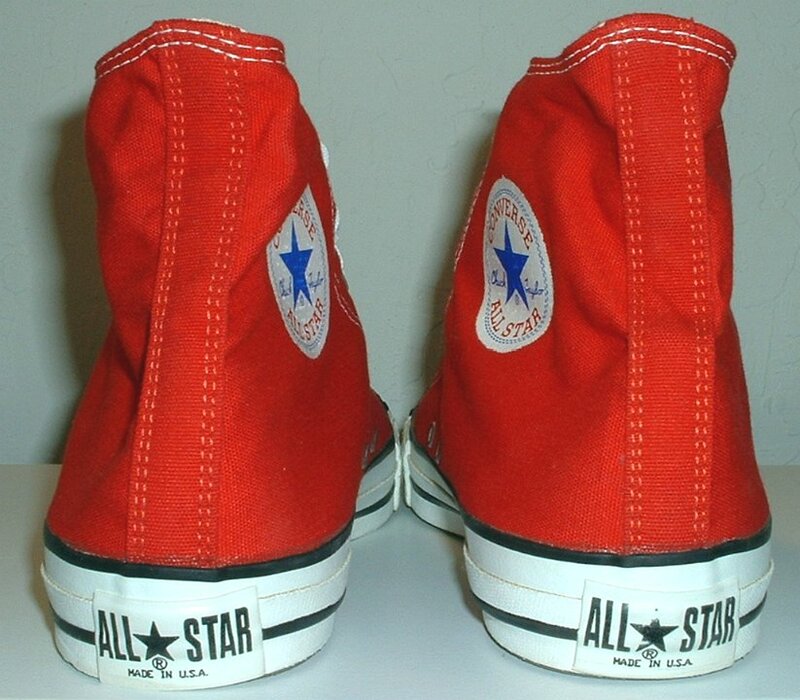 107 Red High Top Chucks Red high tops made in USA, inside patch and sole views. 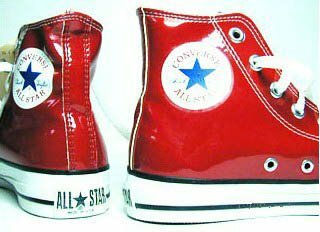 108 Red High Top Chucks Red high tops, made in USA, front and rear views. 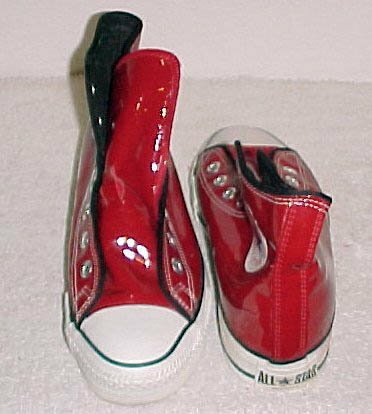 109 Red High Top Chucks Red high tops, made in USA, angled top and side views. 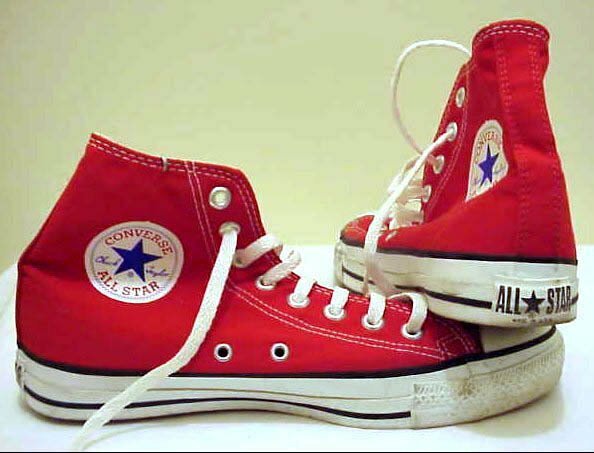 110 Red High Top Chucks Worn red high tops, angled top and side views. 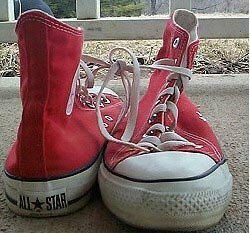 111 Red High Top Chucks Worn vintage red high tops, angled rear and sole views. 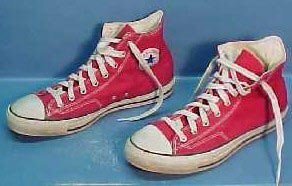 112 Red High Top Chucks Worn vintage red high tops, outside and inside patch views. 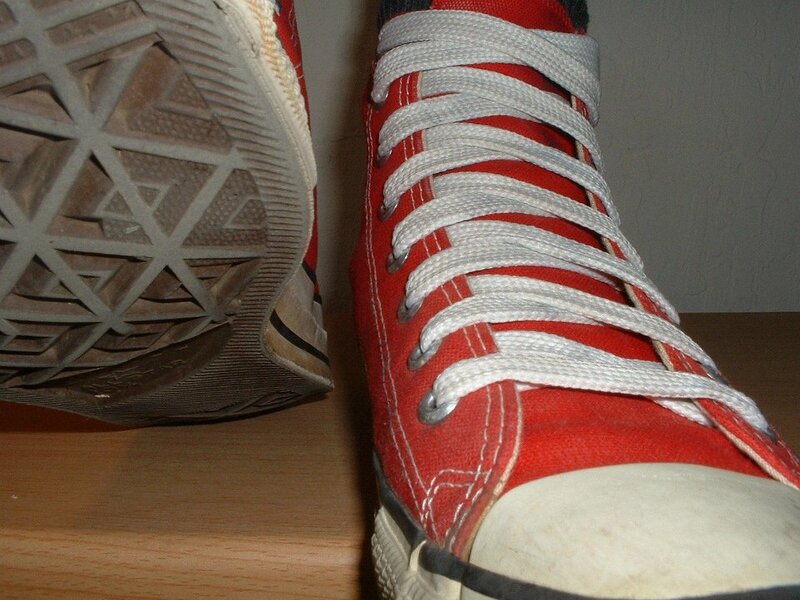 113 Red High Top Chucks Red high tops, top view. 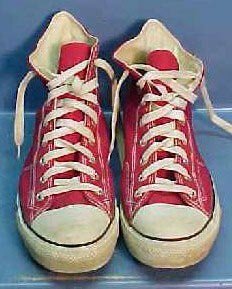 114 Red High Top Chucks Worn vintage red high tops, rear view. 115 Red High Top Chucks New red high tops, inside patch view. 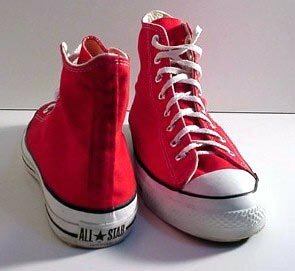 116 Red High Top Chucks Red high tops, front and rear views. 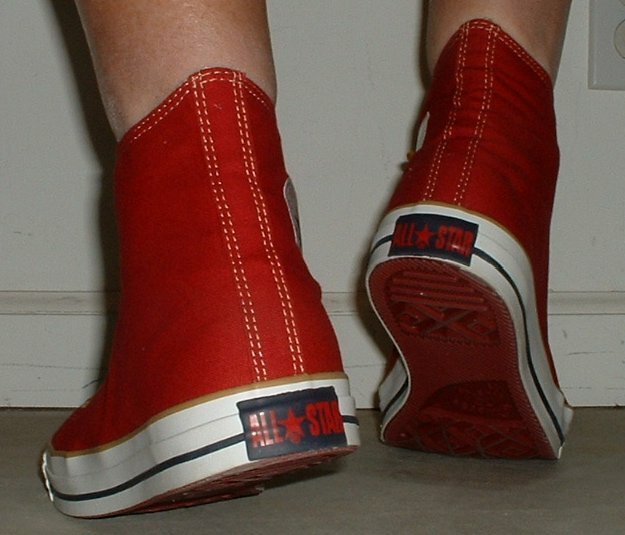 117 Red High Top Chucks Red high tops, angled side view. 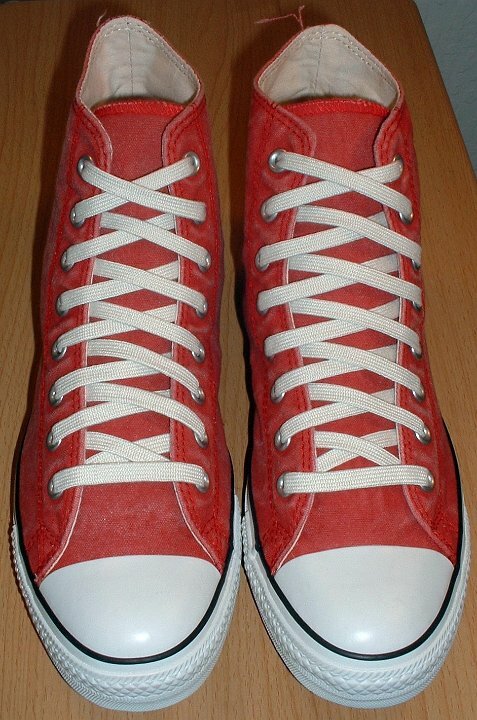 118 Red High Top Chucks Made in USA red high tops with red laces, front view. 119 Red High Top Chucks Vintage red high tops, inside patch view. 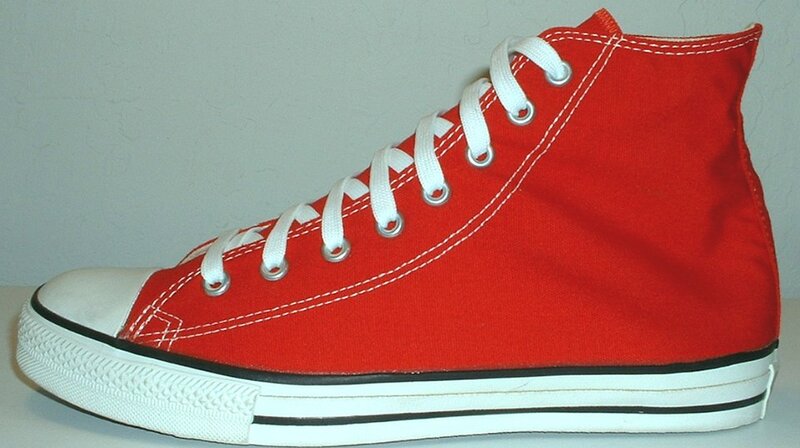 120 Red High Top Chucks Right red high top with straight laces, angled inside patch view. 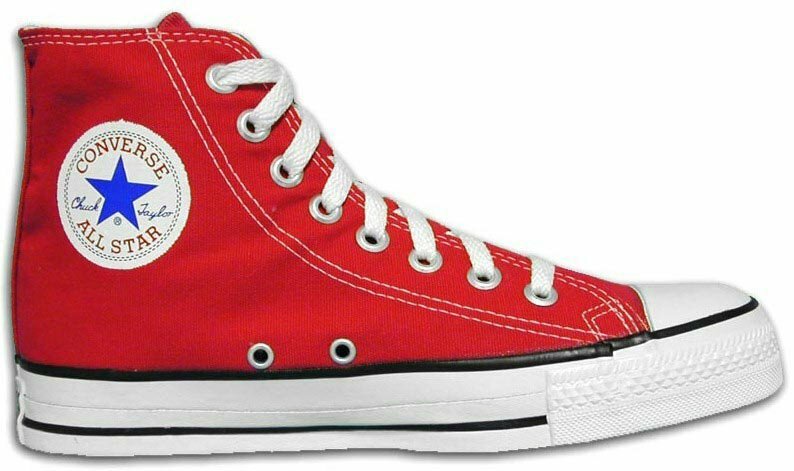 121 Red High Top Chucks Made in USA red high tops with red laces, angled front and inside patch views. 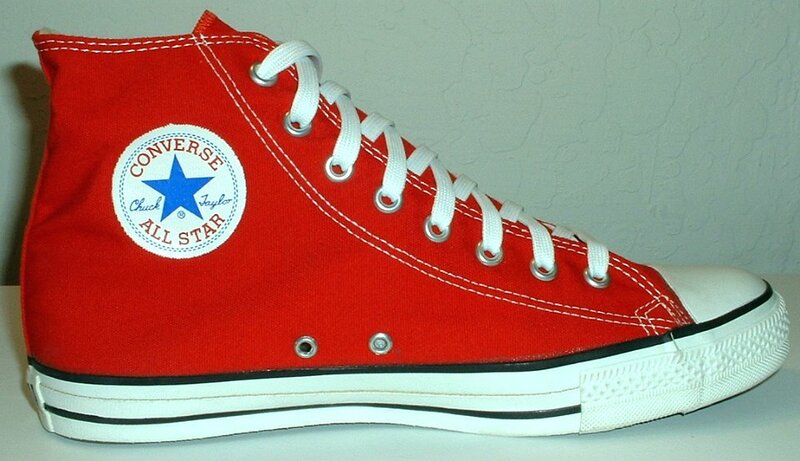 122 Red High Top Chucks Made in USA red high tops with red laces, inside patch and sole views. 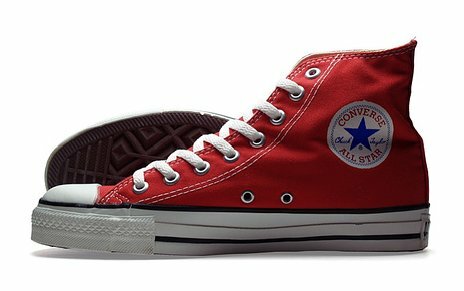 123 Red High Top Chucks Red high tops, angled inside patch and covered sole views. 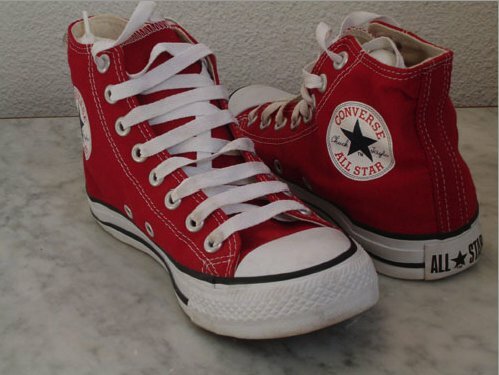 124 Red High Top Chucks Red high tops, top and angled outside views. 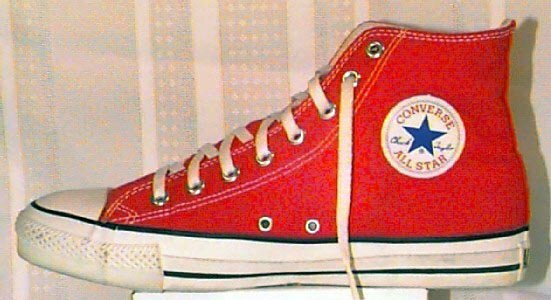 125 Red High Top Chucks Red high tops, angled top and right inside patch views. 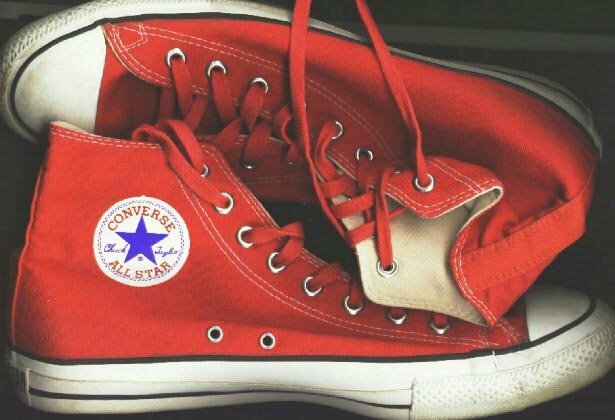 126 Red High Top Chucks Red high tops, inside patch views. 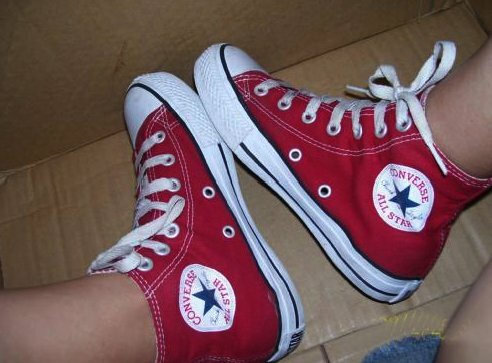 127 Red High Top Chucks Red high tops, top and outside views. 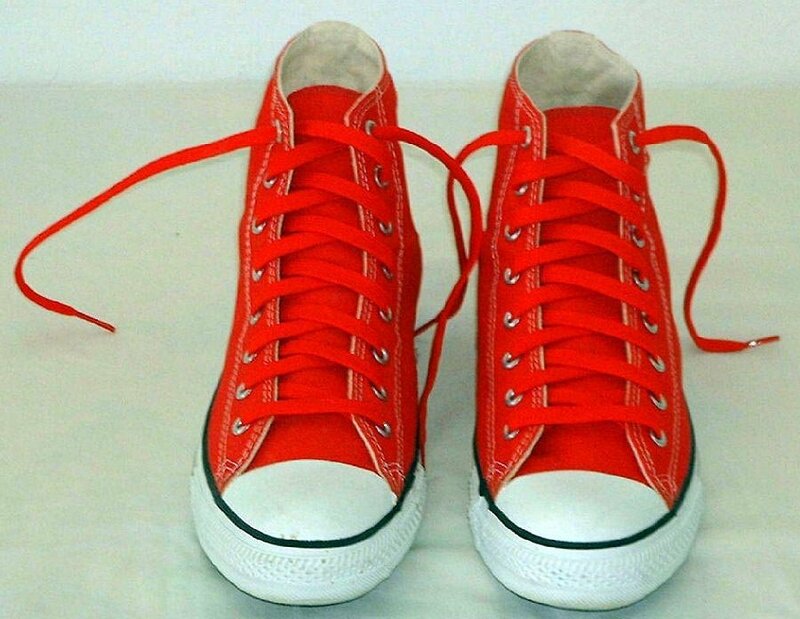 128 Red High Top Chucks New red high tops with tag, box, and straight laces. 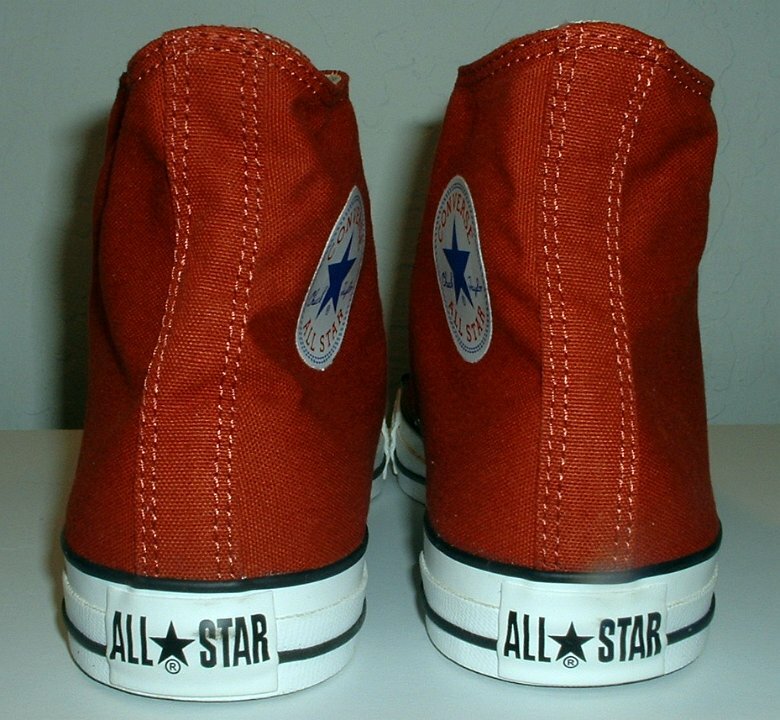 129 Red High Top Chucks Front and inside patch views of red high tops. 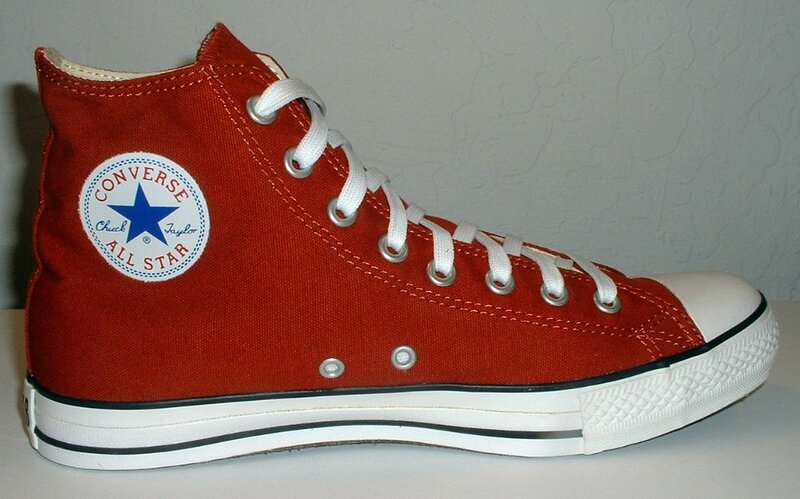 130 Red High Top Chucks Angled side view of a pair of red high top chucks. 131 Red High Top Chucks Angled inside patch view of a right red high top chuck. 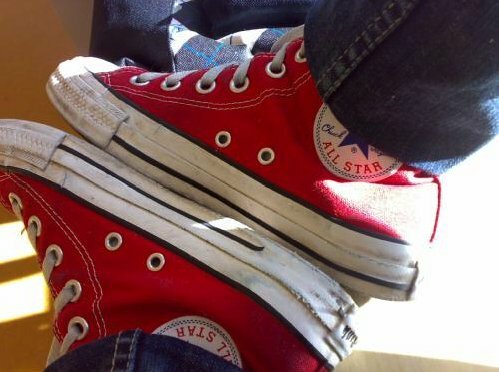 132 Red High Top Chucks inside patch view of a worn red right high top. 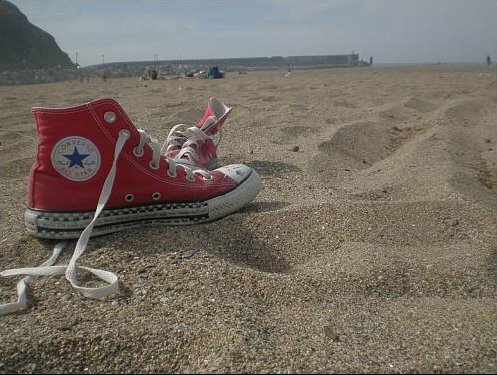 133 Red High Top Chucks Decorated red high tops on the beach. 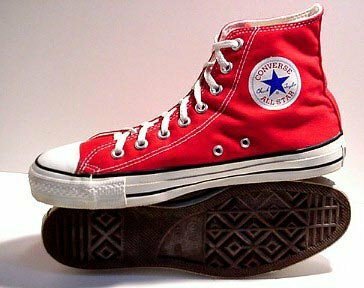 134 Red High Top Chucks Angled left side view of a pair of red high top chucks. 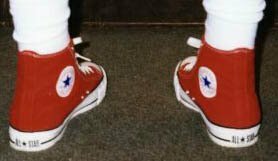 135 Red High Top Chucks Angled outside and sole views of a pair of red high top chucks. 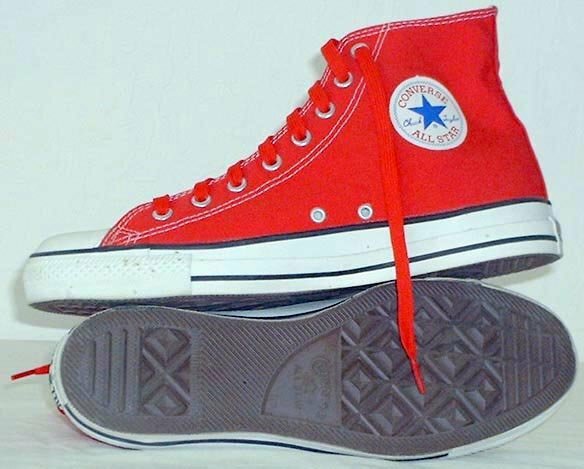 136 Red High Top Chucks Side view of brand new red high top chucks with box. 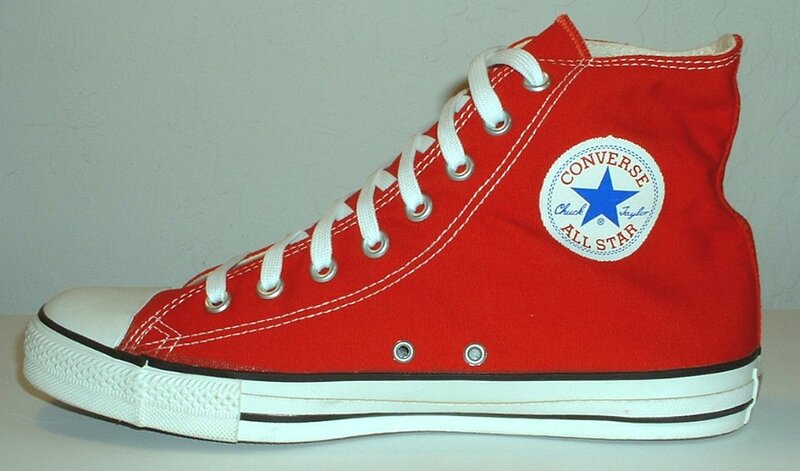 137 Red High Top Chucks Red high tops with red laces, inside patch and partial top view. 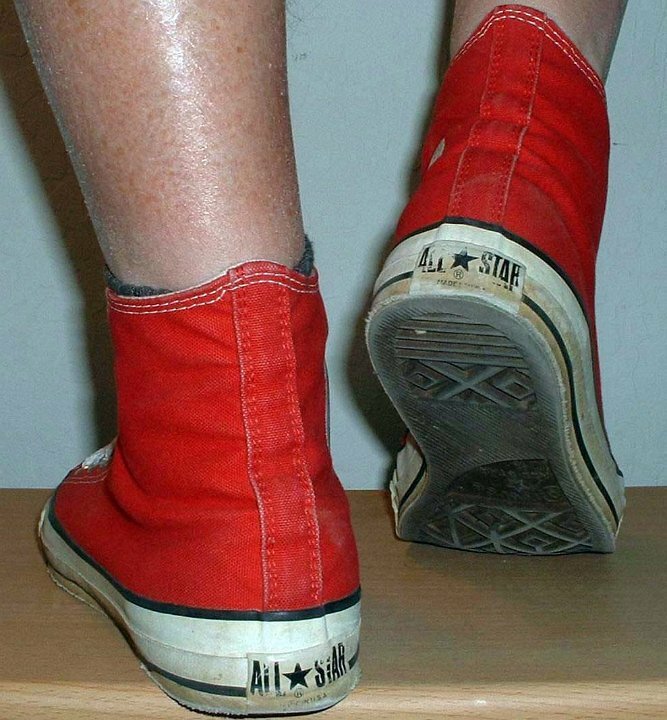 138 Red High Top Chucks Rear view of new vintage red high tops. 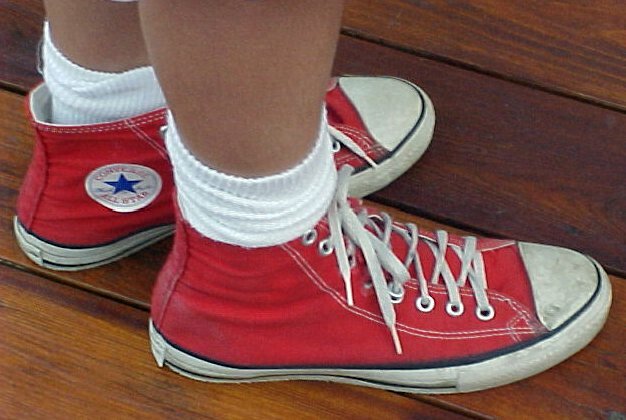 139 Red High Top Chucks This pari of red high top chucks stands out in a row of plain white Keds. 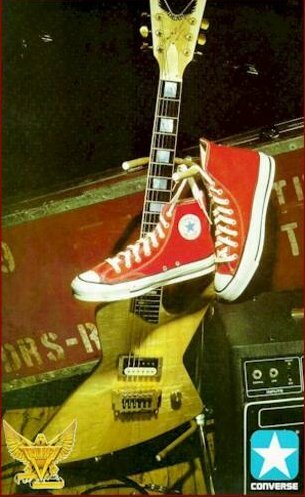 140 Red High Top Chucks Converse Chuck Taylor red high tops, the sole of rock 'n' roll. 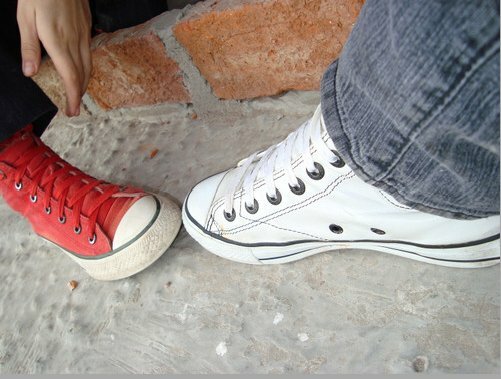 141 Red High Top Chucks Outside views of red high top chucks. 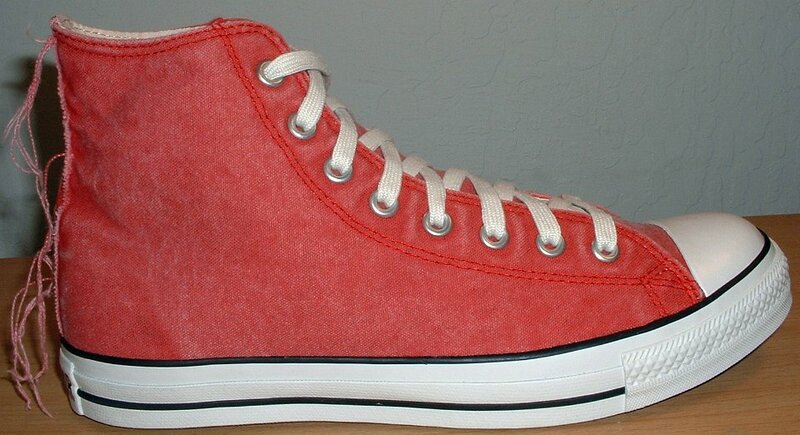 142 Red High Top Chucks Red high tops with red piping, angled inside patch views. 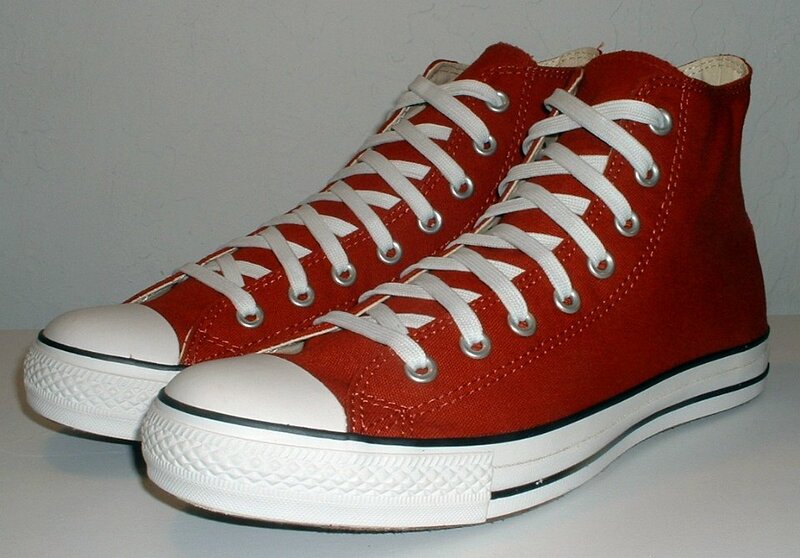 143 Red High Top Chucks New red leather high tops with tag, top view. 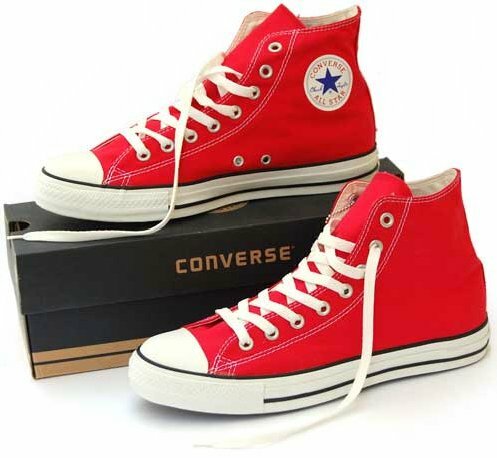 144 Red High Top Chucks Wearing red leather high tops. 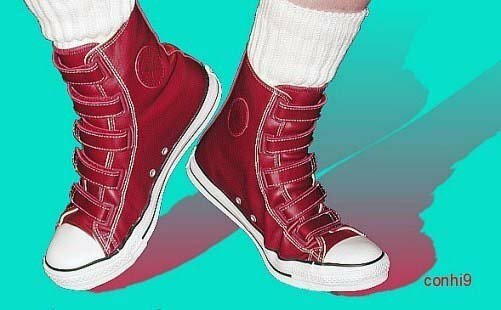 145 Red High Top Chucks Red leather high tops with velcro straps. 146 Red High Top Chucks Top view of a new red leather high top with tag. 147 Red High Top Chucks Inside patch view of a brand new left red leather high top. 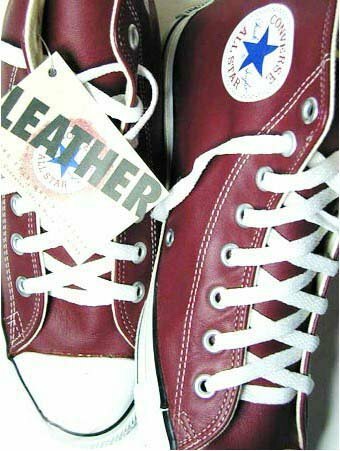 148 Red High Top Chucks New red leather high tops with tag, side views. 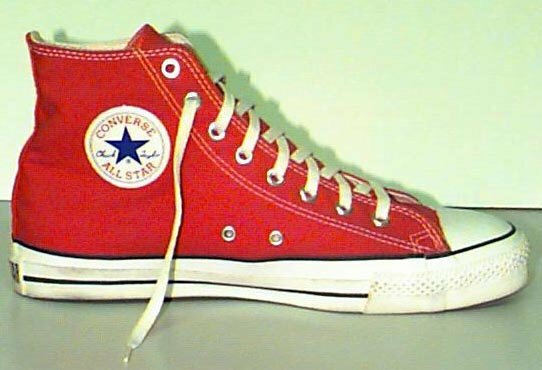 149 Red High Top Chucks Retro red and black high tops, angled side view. 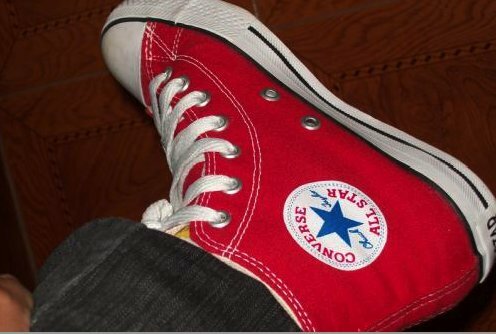 150 Red High Top Chucks Sole view of a left red satin high top. 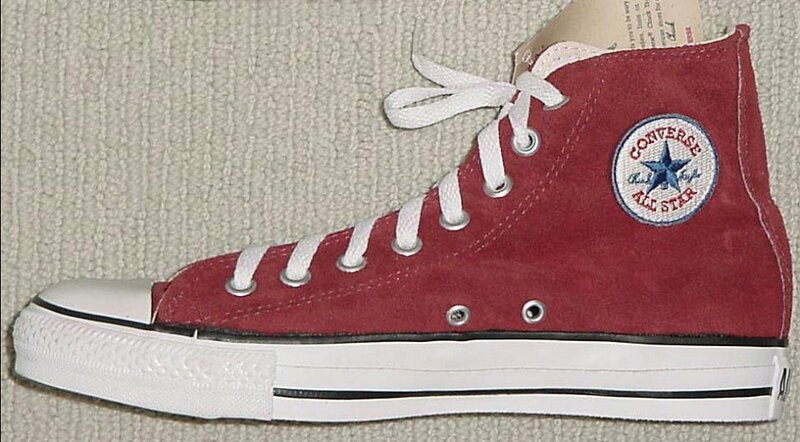 151 Red High Top Chucks Red satin left high top with red laces and navy blue interior, inside patch view. 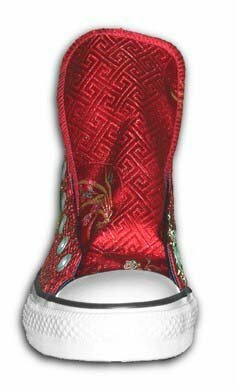 152 Red High Top Chucks Red satin high top without laces, showing graphic on the shoe tongue. 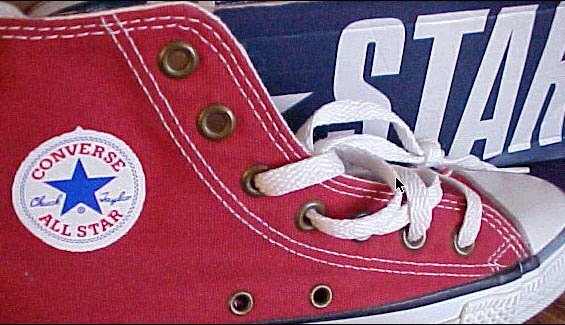 153 Red High Top Chucks Red satin left high top with red laces and navy blue interior, angled inside patch view. 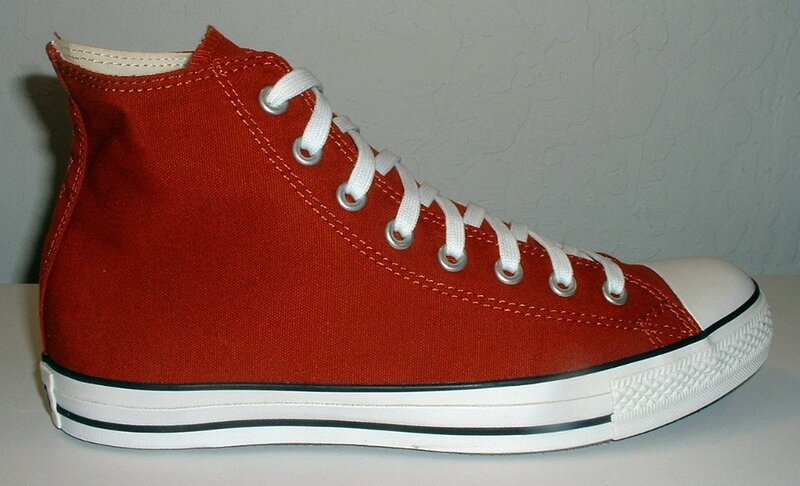 154 Red High Top Chucks Top view of a new left red suede high top with tag. 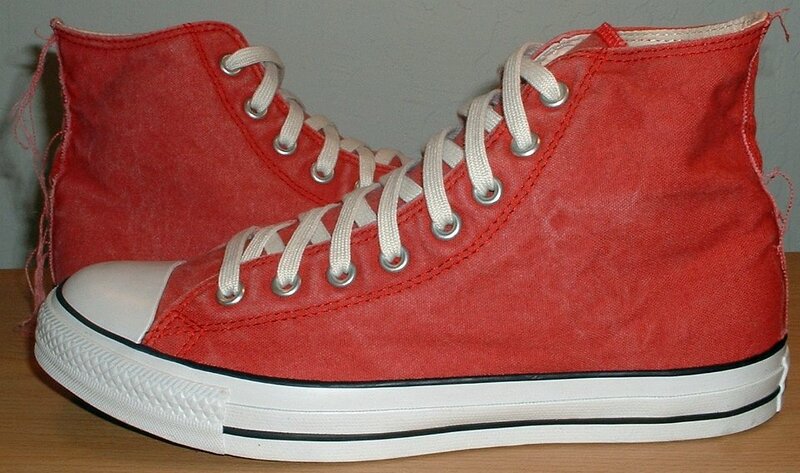 155 Red High Top Chucks Right red suede high top, inside view showing embroidered patch. 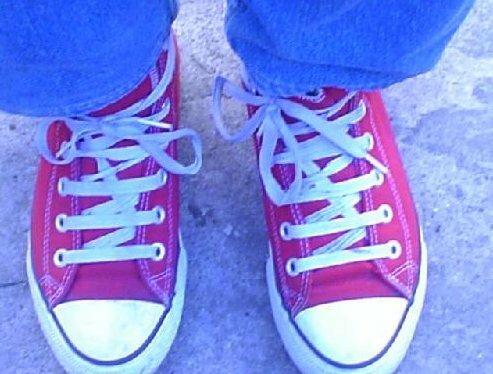 156 Red High Top Chucks Front closeup of red high tops with wide laces. 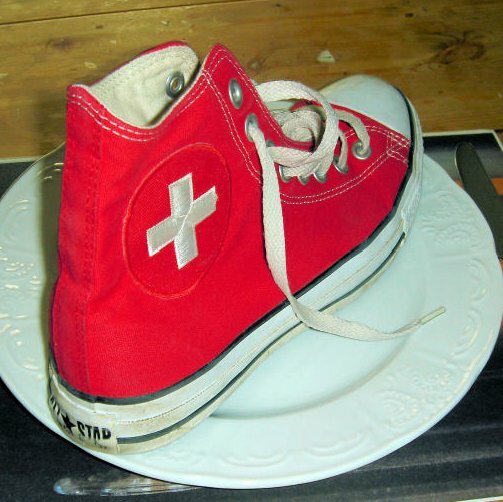 157 Red High Top Chucks Right red high top chuck with the Swiss flag emblem on the outside. 158 Red High Top Chucks University of Nevada Las Vega red high tops, inside patch view. 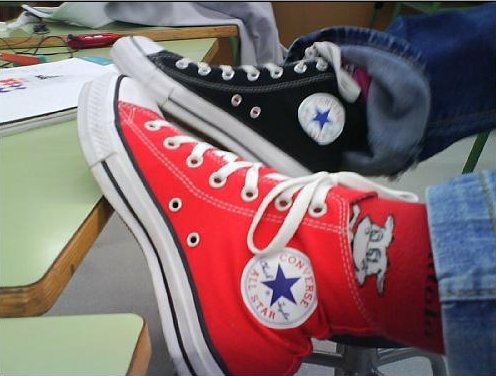 159 Red High Top Chucks UNLV red high tops, showing both patches. 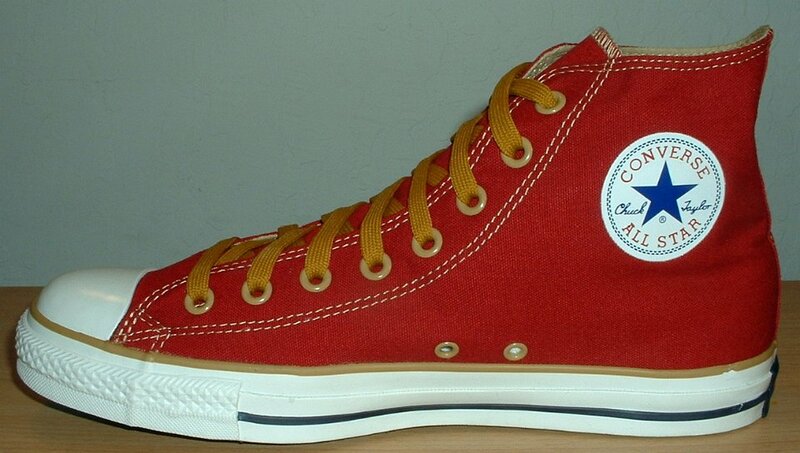 160 Red High Top Chucks Wearing red and gold foldover chucks, front view. 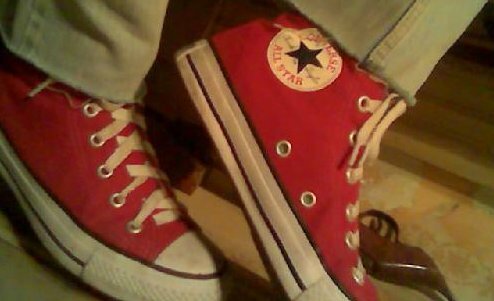 161 Red High Top Chucks Stepping out in red and gold foldover high tops chucks. 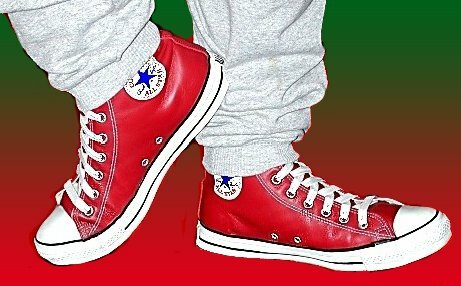 162 Red High Top Chucks Stepping out in red and gold high top chucks. 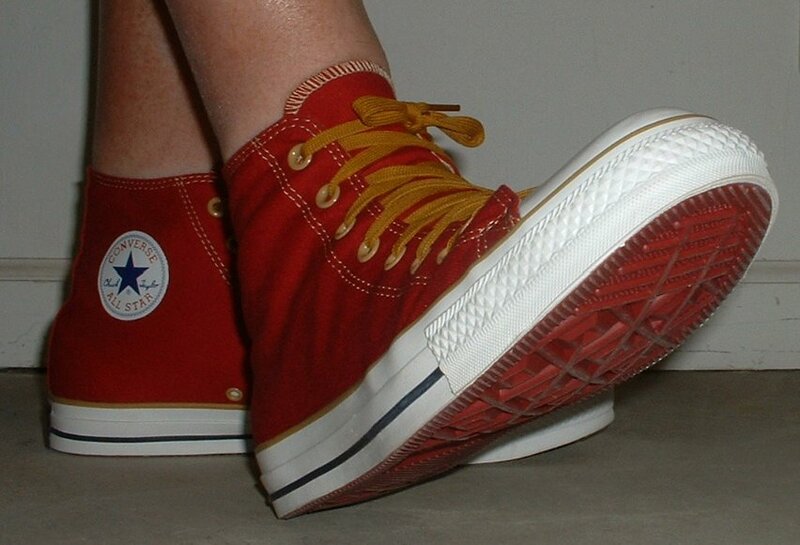 163 Red High Top Chucks Wearing red and gold foldover chucks, side views. 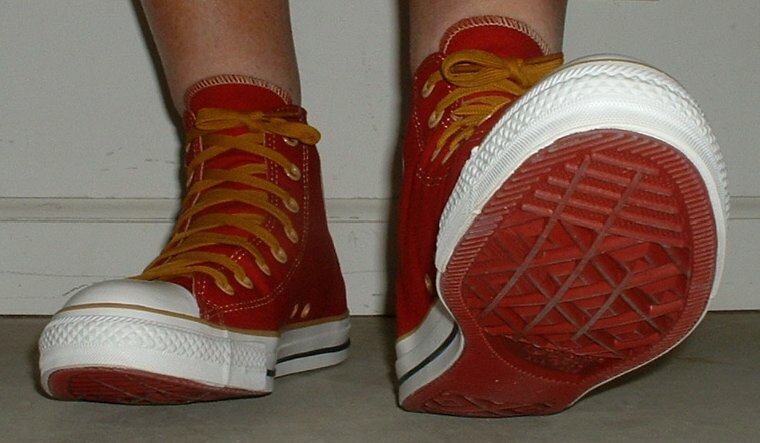 164 Red High Top Chucks Wearing red and gold high top chucks, rear view. 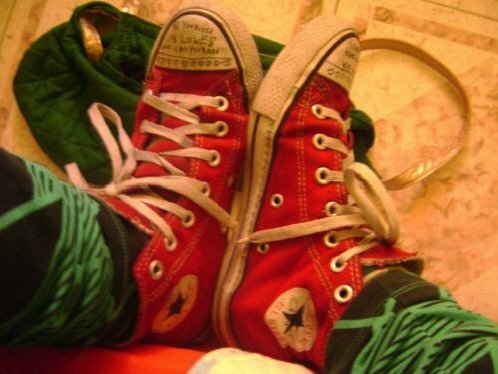 165 Red High Top Chucks Wearing red and gold high top chucks. 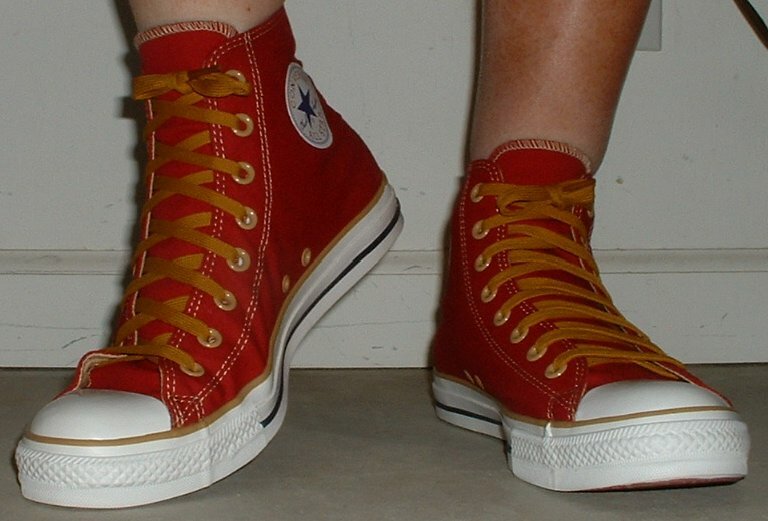 166 Red High Top Chucks Stepping out in red and gold high top chucks, rear view. 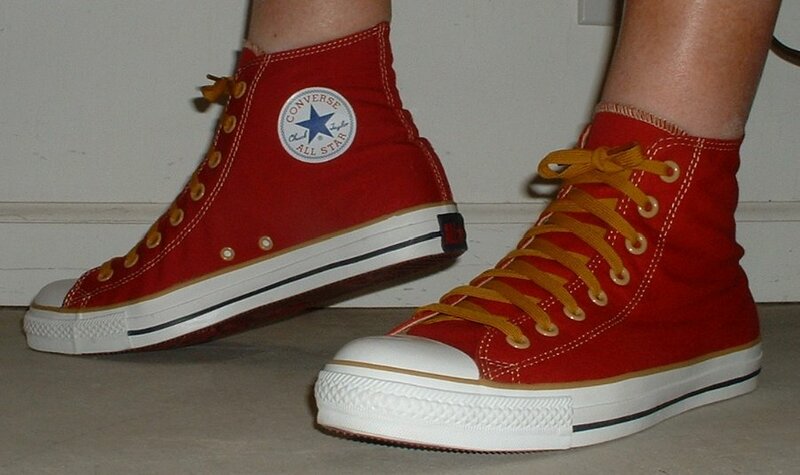 167 Red High Top Chucks Wearing red and gold foldover high top chucks. 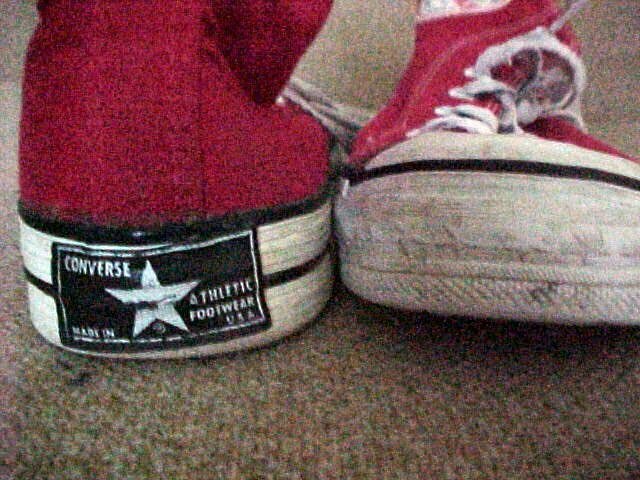 168 Red High Top Chucks Looking past a pair of red and gold high top chucks with navy blue laces. 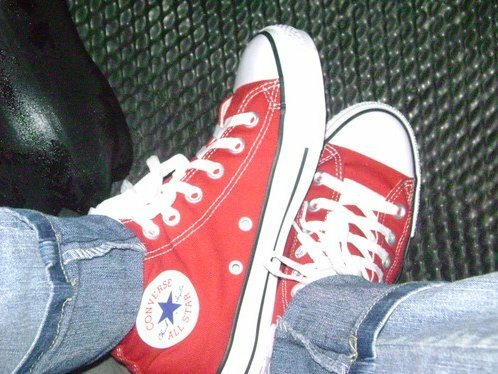 169 Red High Top Chucks Wearing new red high tops. 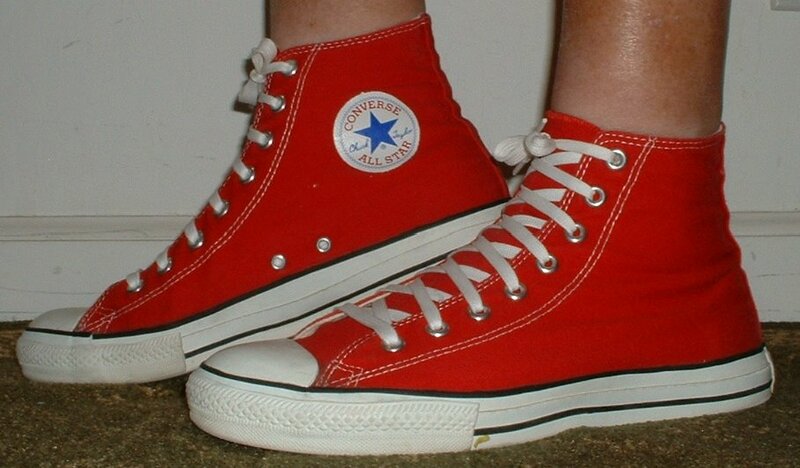 170 Red High Top Chucks Wearing red high tops, outside view. 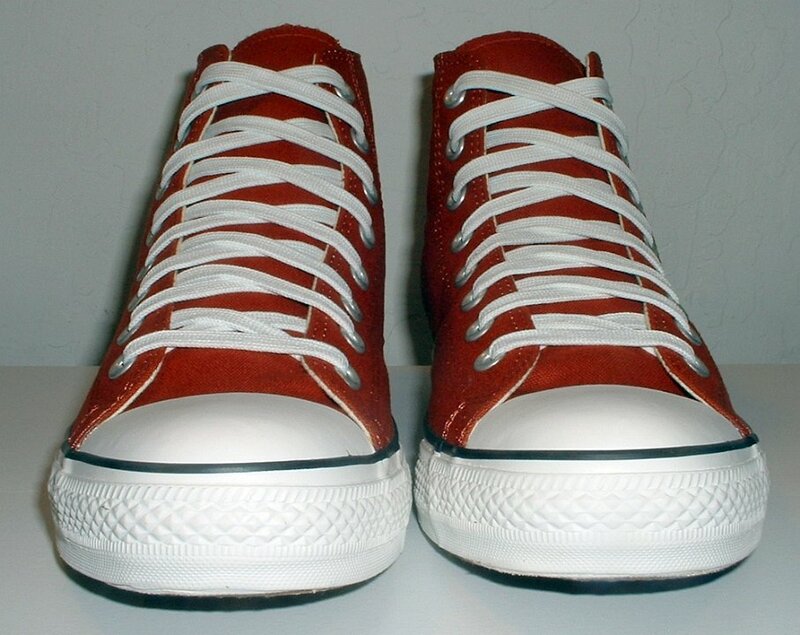 171 Red High Top Chucks Wearing new red high tops, angled top view. 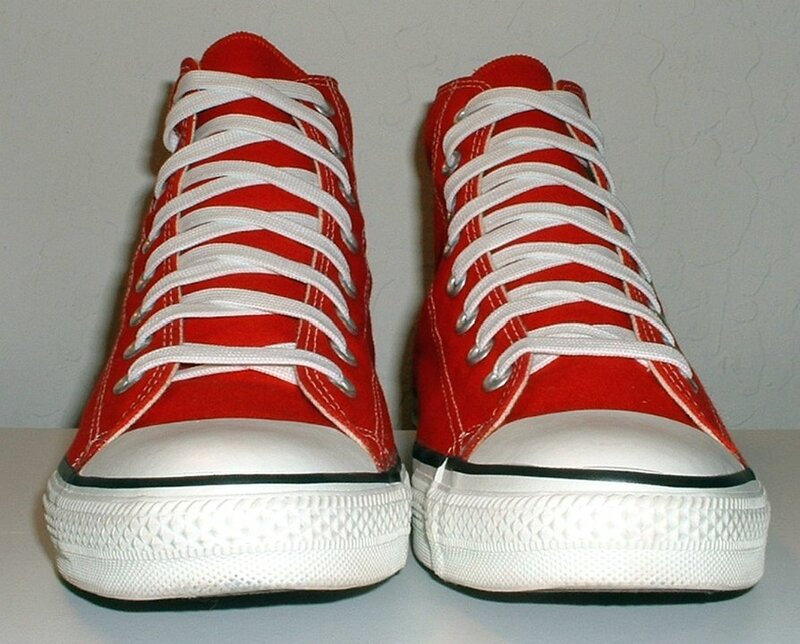 172 Red High Top Chucks Wearing new red high tops, angled top view. 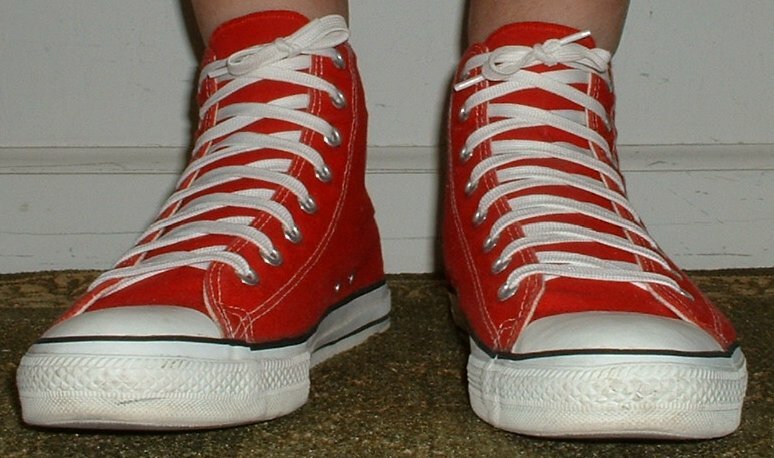 173 Red High Top Chucks Wearing new red high tops, left side view. 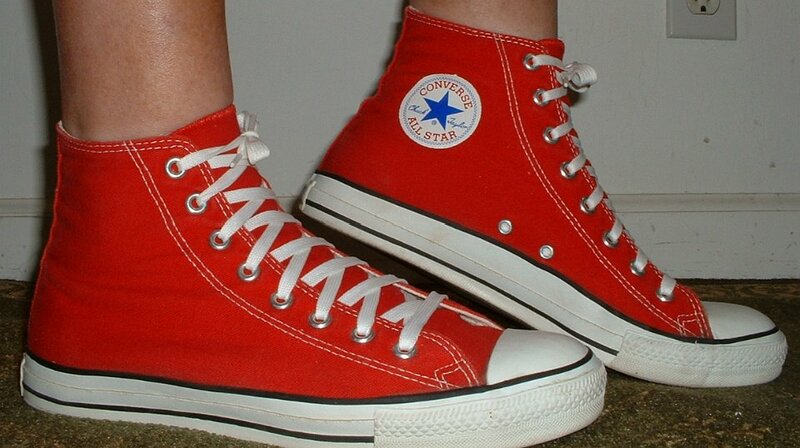 174 Red High Top Chucks Wearing new red high tops, front view. 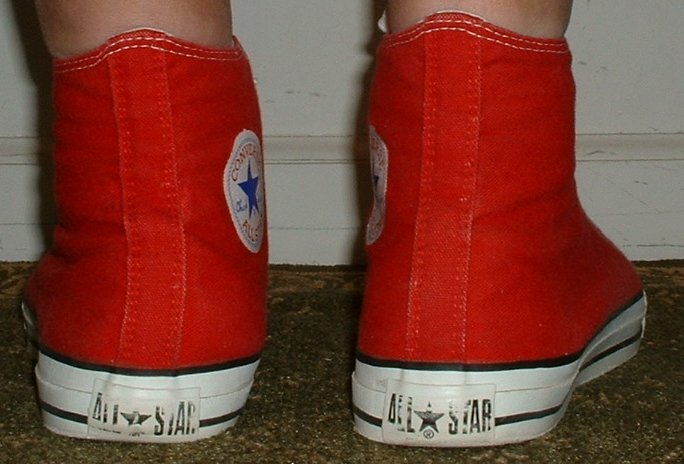 175 Red High Top Chucks Wearing new red high tops, rear view. 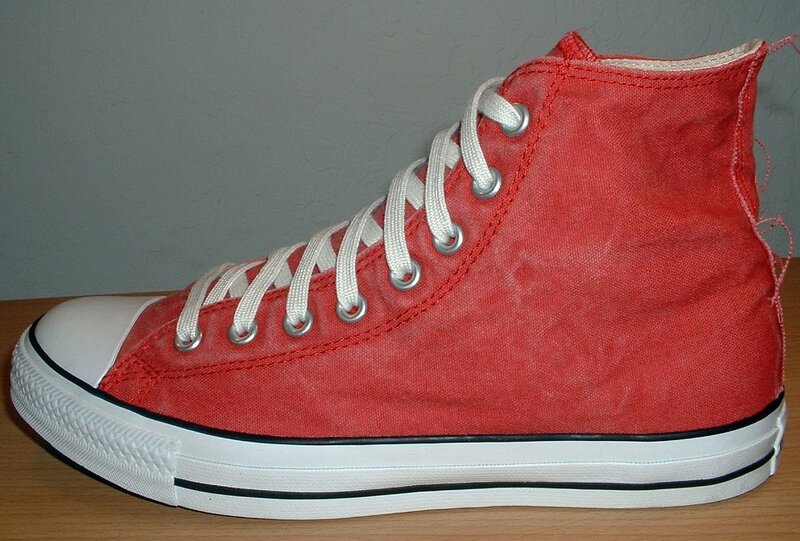 176 Red High Top Chucks Wearing new red high tops, inside patch and angled top view. 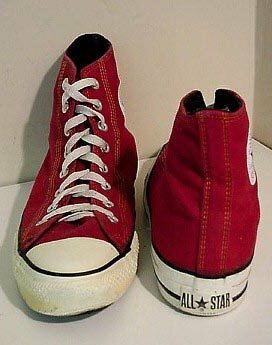 177 Red High Top Chucks Comparing red and black high top chucks. 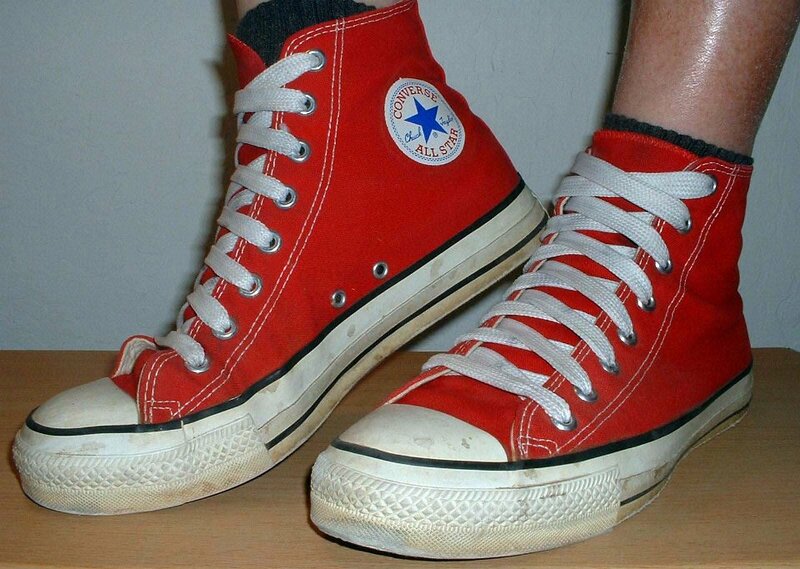 178 Red High Top Chucks Kneeling down in a pair of red high top chucks. 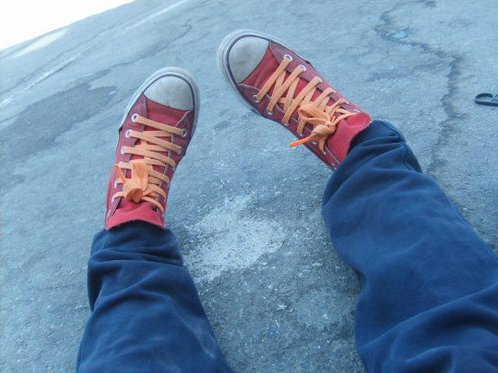 179 Red High Top Chucks Lounging in new red high tops. 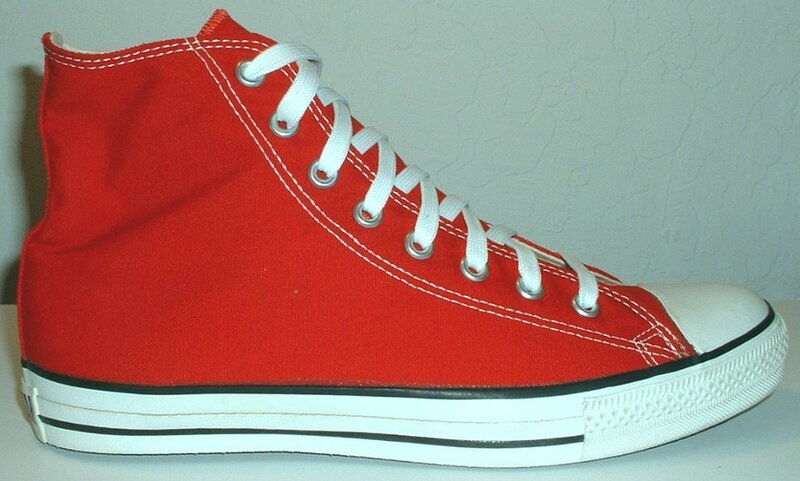 180 Red High Top Chucks Wearing made in USA red high tops, front view shot 1. 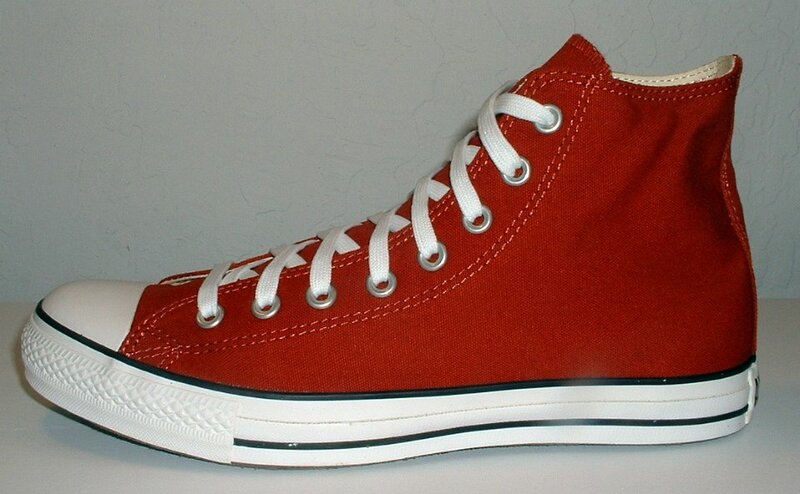 181 Red High Top Chucks Wearing red high tops, right side view. 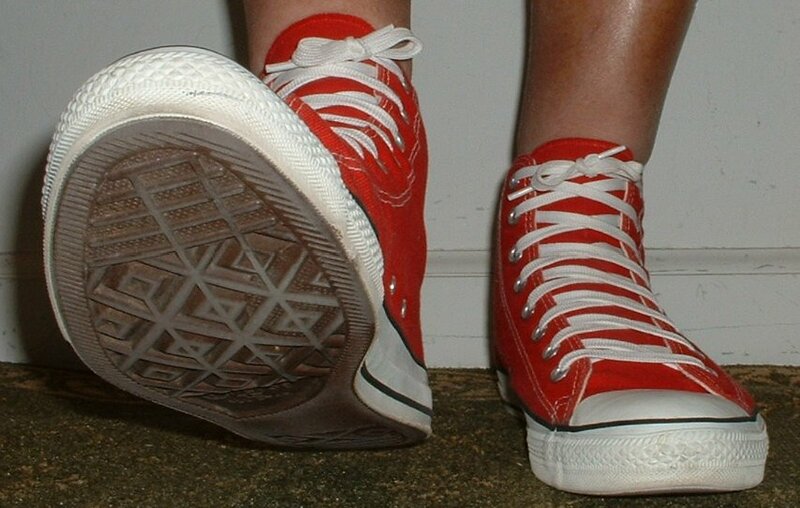 182 Red High Top Chucks Wearing red high tops, rear view. 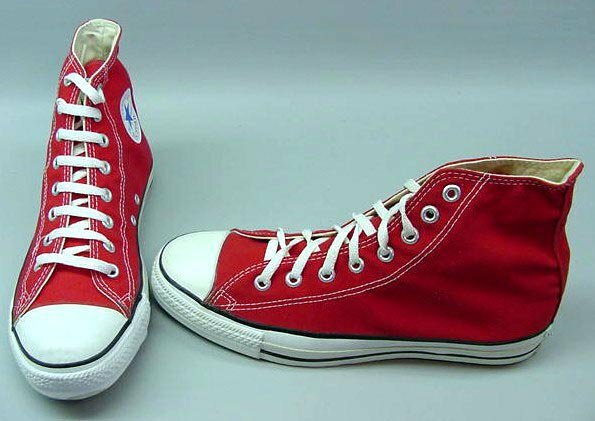 183 Red High Top Chucks Wearing red high tops, front and side view. 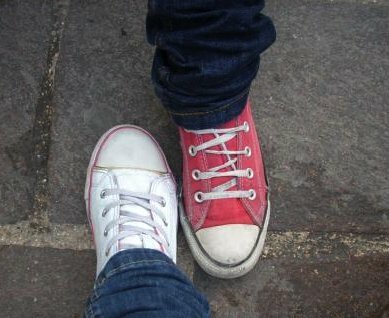 184 Red High Top Chucks Looking at a pair of red high top chucks with gold shoelaces. 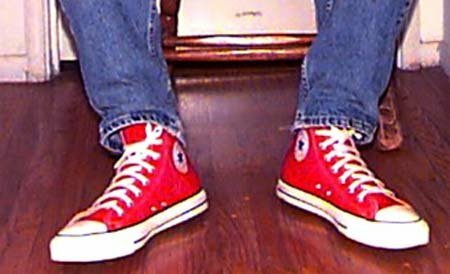 185 Red High Top Chucks Kicking back in red high tops, front view. 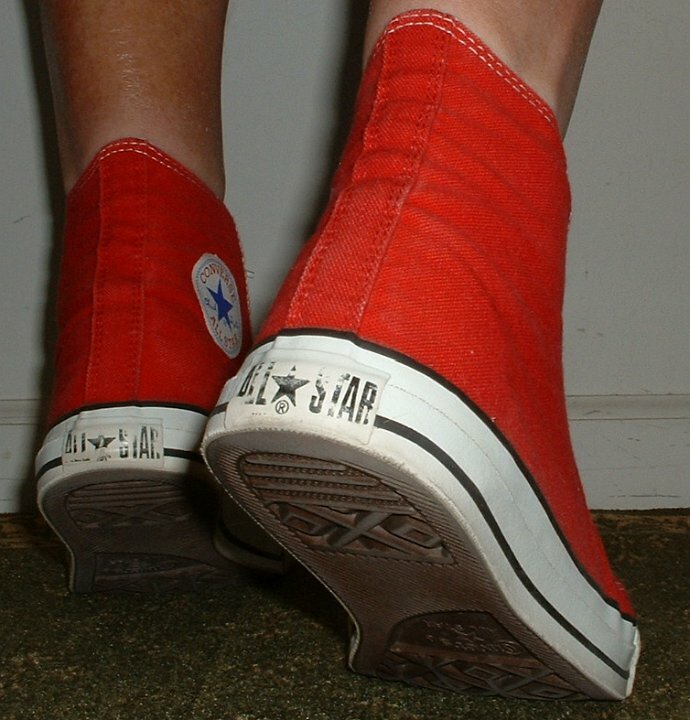 186 Red High Top Chucks Wearing red high top chucks, angled sole views. 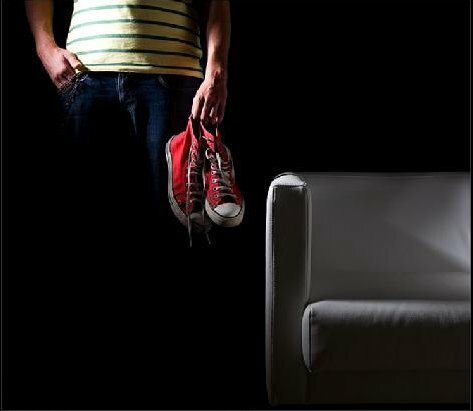 187 Red High Top Chucks Standing on a couch wearing red high tops. 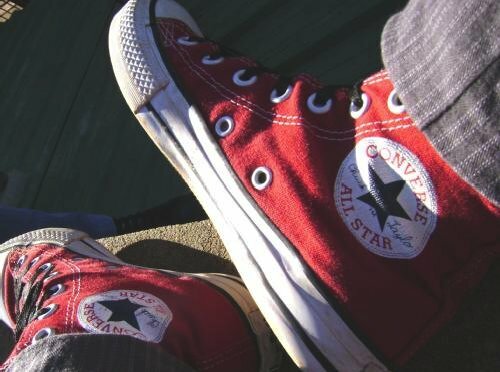 188 Red High Top Chucks Wearing red high top chucks, inside patch views. 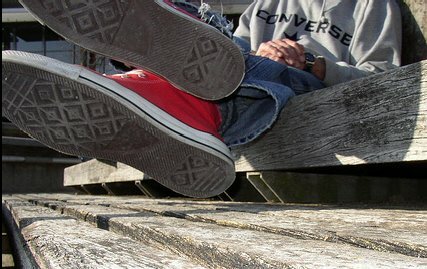 189 Red High Top Chucks Wearing red high top chucks on a pier, inside patch view. 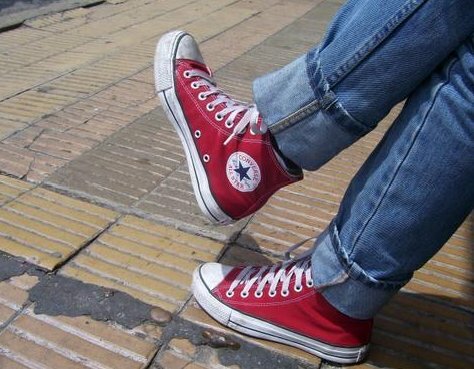 190 Red High Top Chucks Wearing red high top chucks on a street curb, inside patch view. 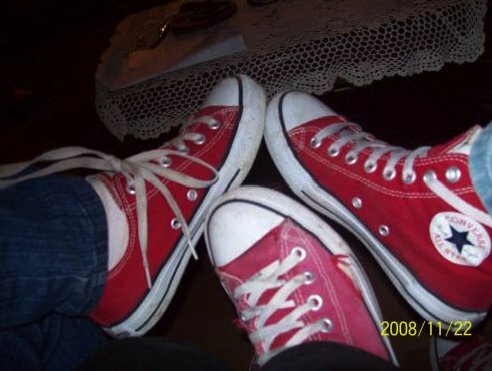 191 Red High Top Chucks Two chucks wearers showing off their red high tops. 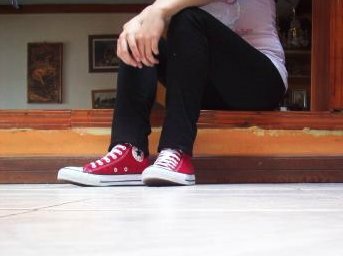 192 Red High Top Chucks Seated on the floor wearing red high top chucks. 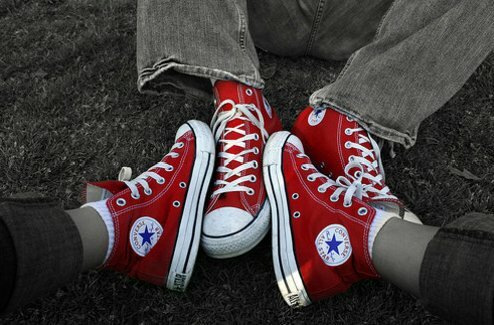 193 Red High Top Chucks Seated on the floor wearing red high top chucks. 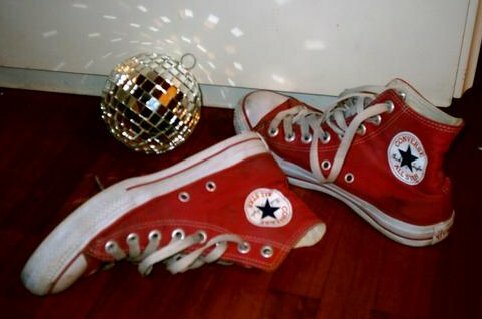 195 Red High Top Chucks Showing off a right red high top chucks with attached bling. 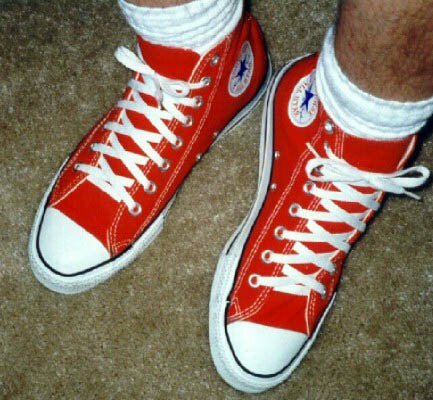 196 Red High Top Chucks Showing off a pair od red high top chucks. 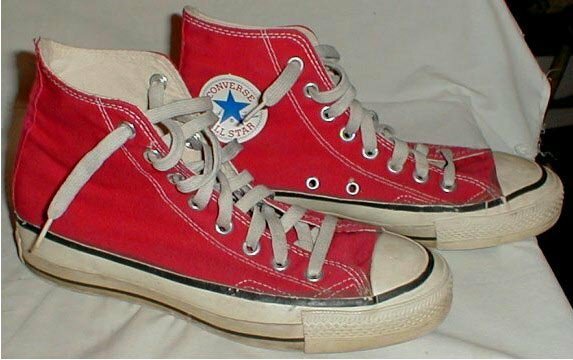 197 Red High Top Chucks Wearing red high top chucks, inside patch views. 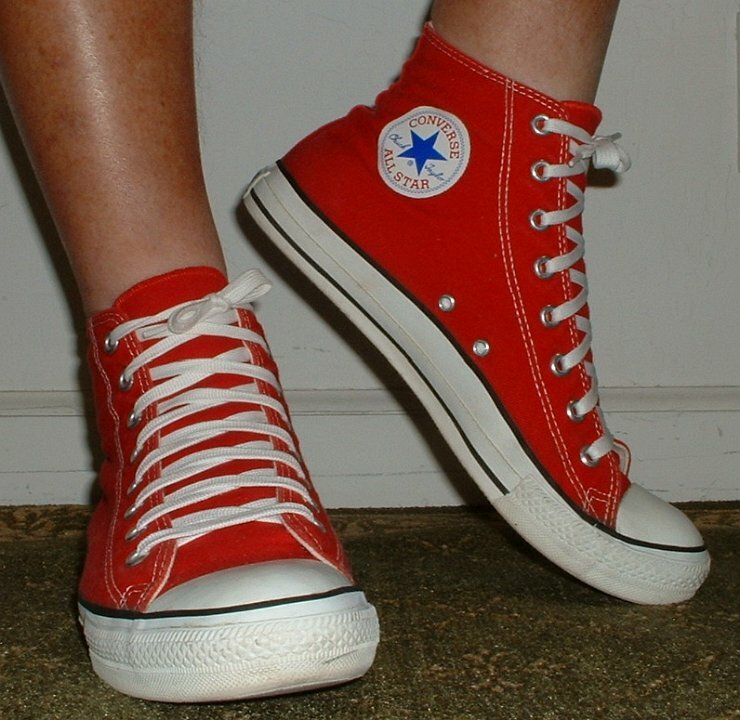 199 Red High Top Chucks Wearing unlaced red high top chucks, top view. 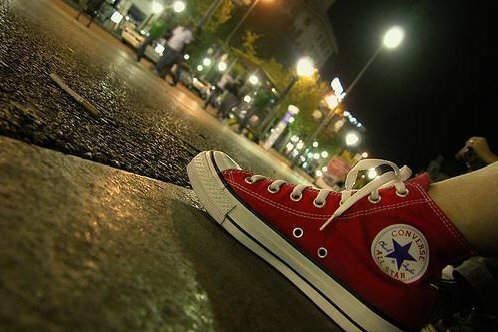 200 Red High Top Chucks Wearing red high top chucks sitting on a curb. 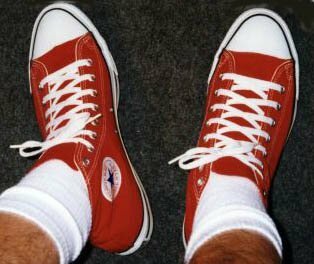 201 Red High Top Chucks Guy seated on the floor wearing red high top chucks. 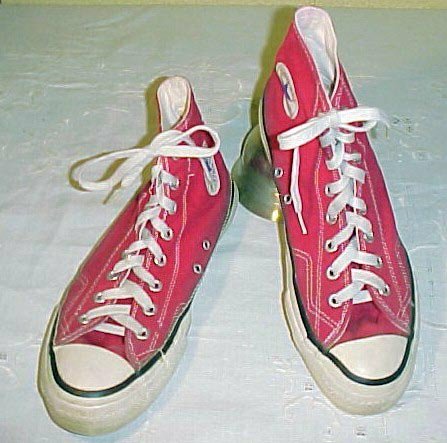 202 Red High Top Chucks Wearing red high top chucks in school. 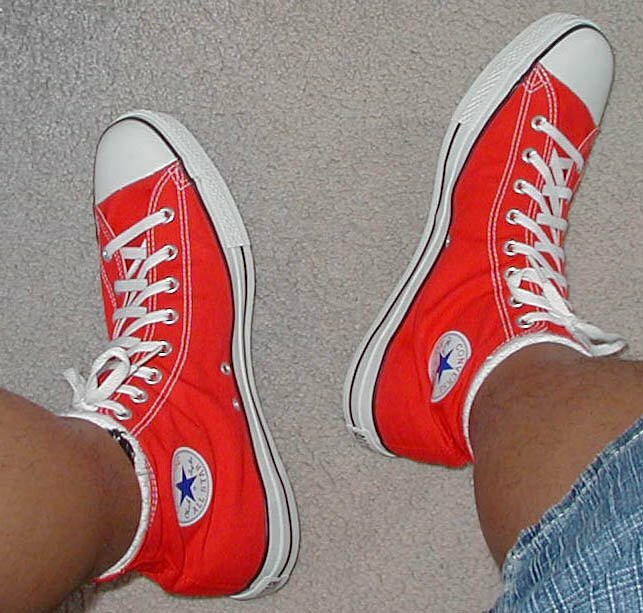 203 Red High Top Chucks Wearing red high top chucks, front view. 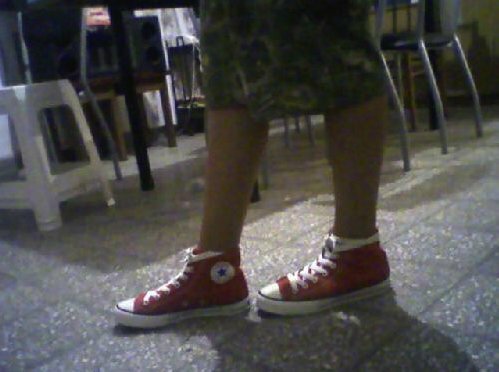 204 Red High Top Chucks Wearing red high top chucks, front view 2. 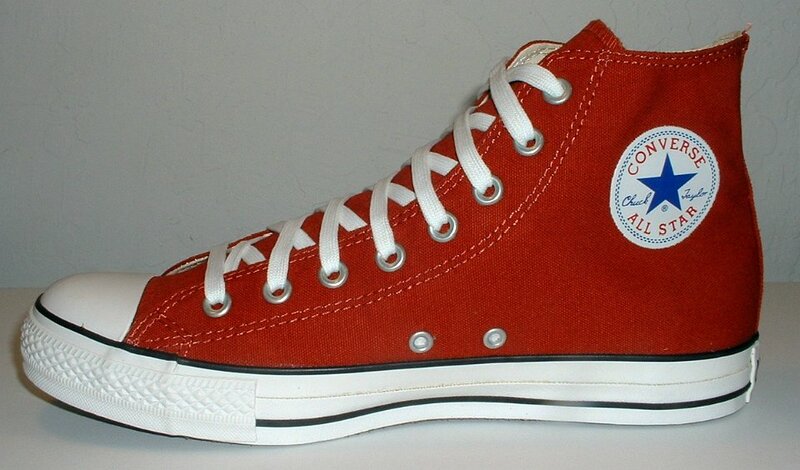 205 Red High Top Chucks Wearing red high top chucks, front and inside patch views. 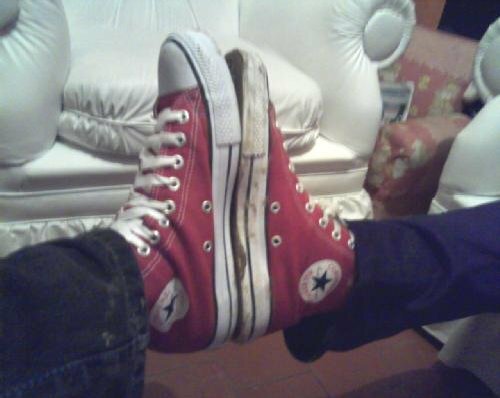 206 Red High Top Chucks Wearing red high top chucks, right side view. 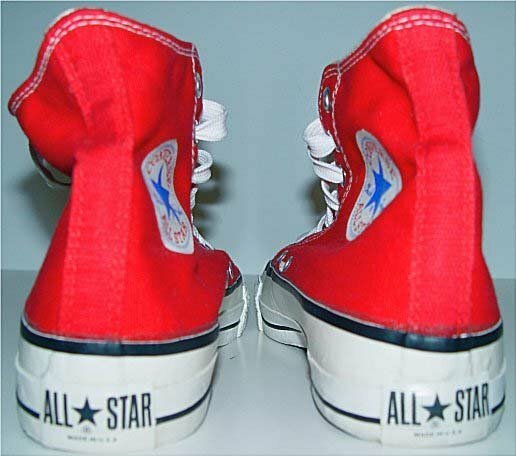 207 Red High Top Chucks Wearing red high top chucks, inside patch and angled top views. 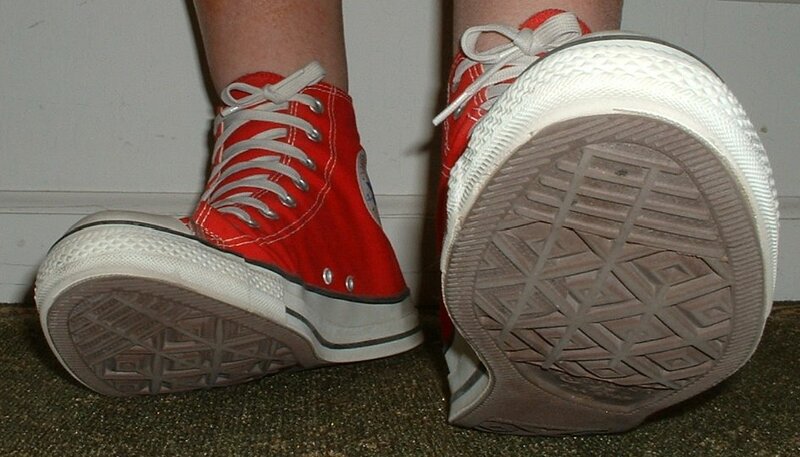 208 Red High Top Chucks Wearing red high top chucks, rear view. 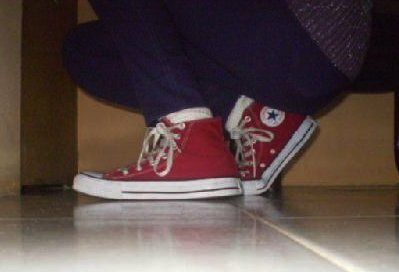 209 Red High Top Chucks Wearing red high top chucks, rear view. 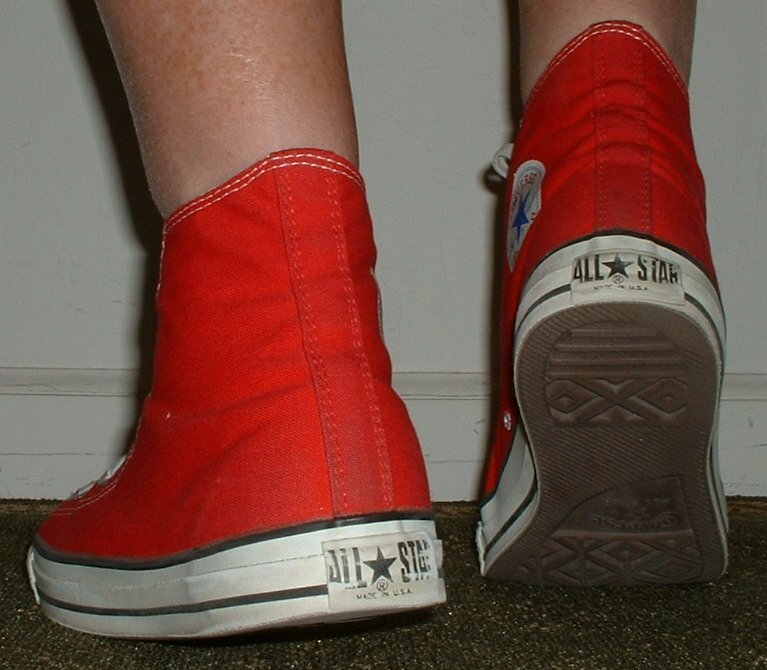 210 Red High Top Chucks Wearing red high top chucks, rear view. 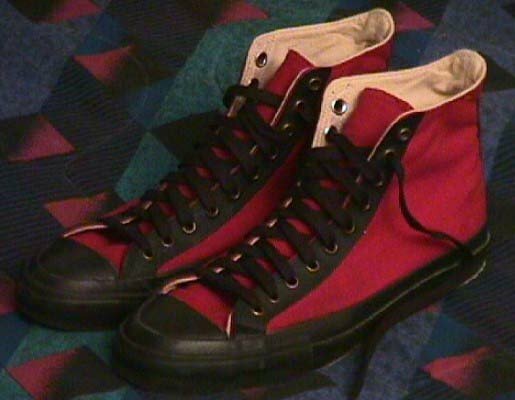 211 Red High Top Chucks Wearing red high top chucks,left side view. 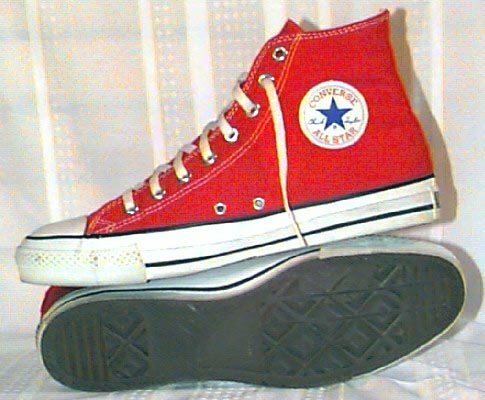 212 Red High Top Chucks Wearing red high top chucks, left side and top views. 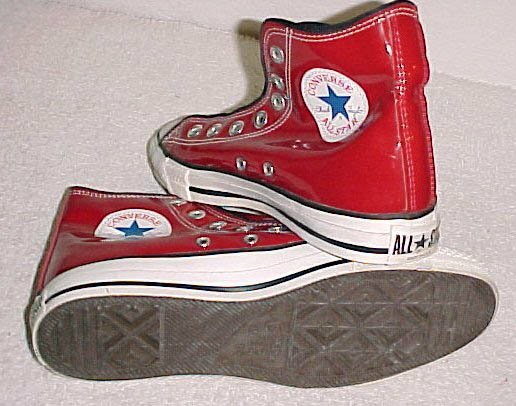 213 Red High Top Chucks Wearing red high top chucks, front view. 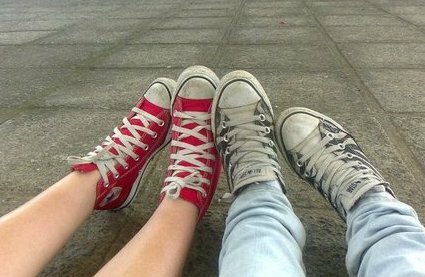 214 Red High Top Chucks Two girls seated side by side wearing red high top chucks. 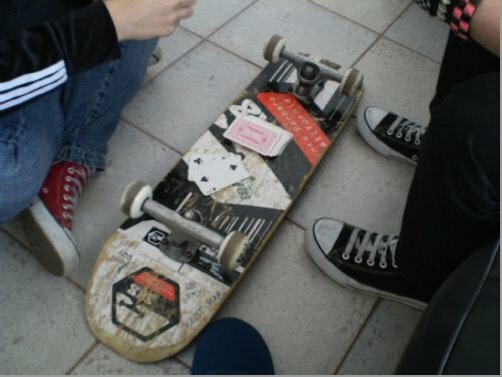 215 Red High Top Chucks Sittiing on a deck, sporting red high top chucks. 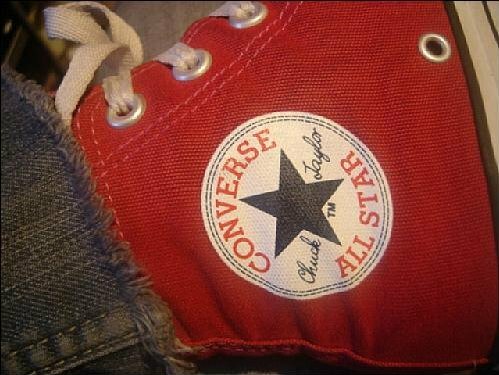 216 Red High Top Chucks Wearing a left red high top chuck, inside patch view. 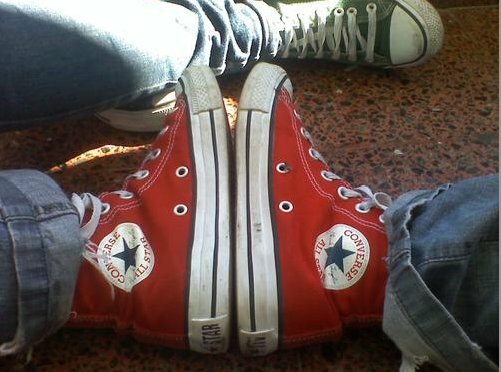 217 Red High Top Chucks Comparing red and white high top chucks. 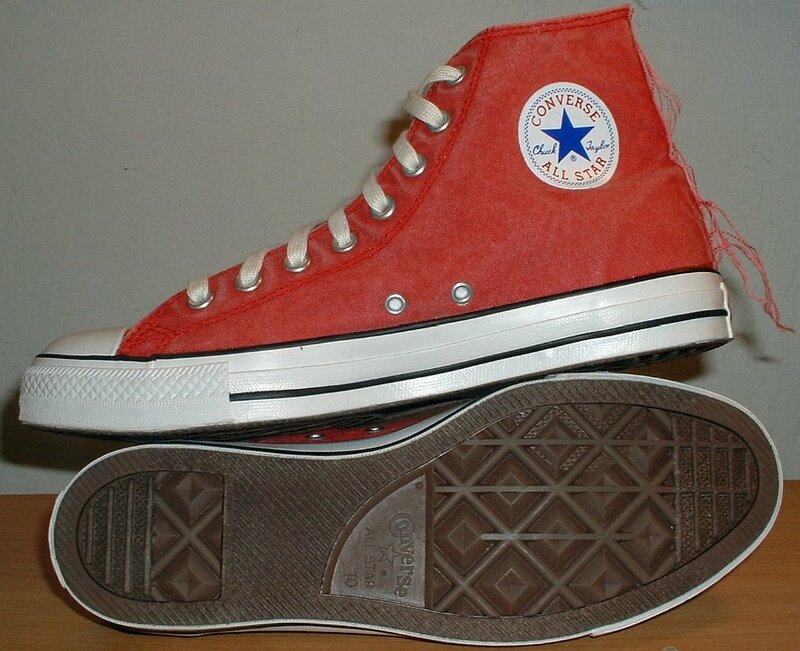 218 Red High Top Chucks Wearing a left red high top chuck, inside patch view. 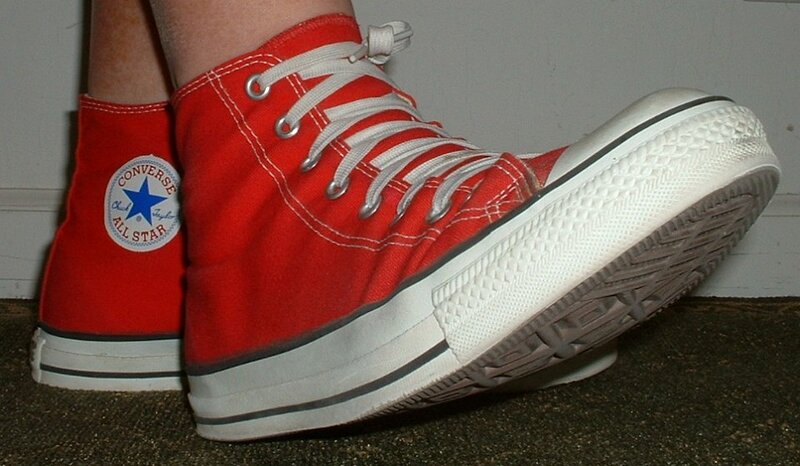 219 Red High Top Chucks Wearing red high top chucks, inside patch and top views. 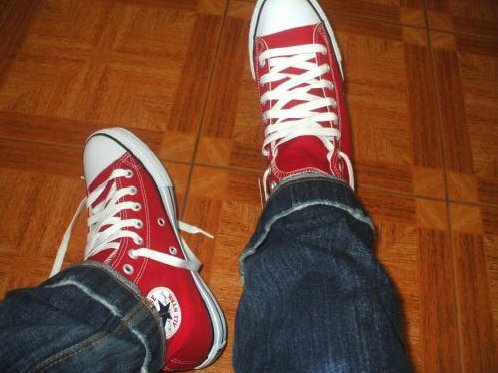 220 Red High Top Chucks Wearing red high top chucks, inside patch views. 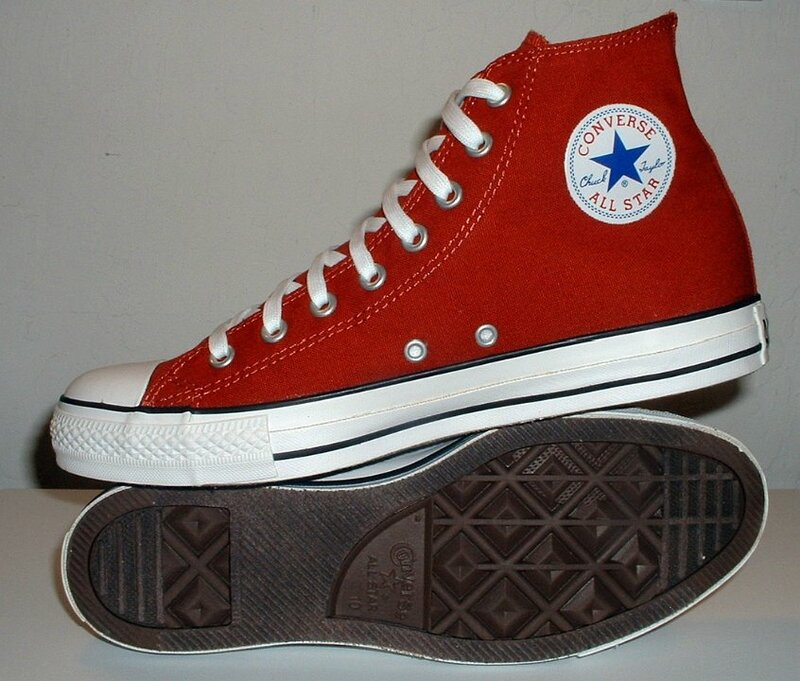 221 Red High Top Chucks Wearing red high top chucks, inside patch views. 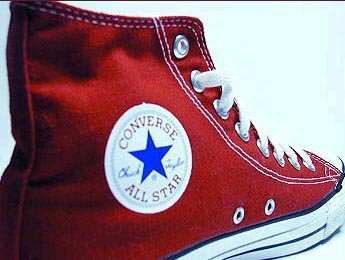 222 Red High Top Chucks Wearing red high top chucks, inside patch views. 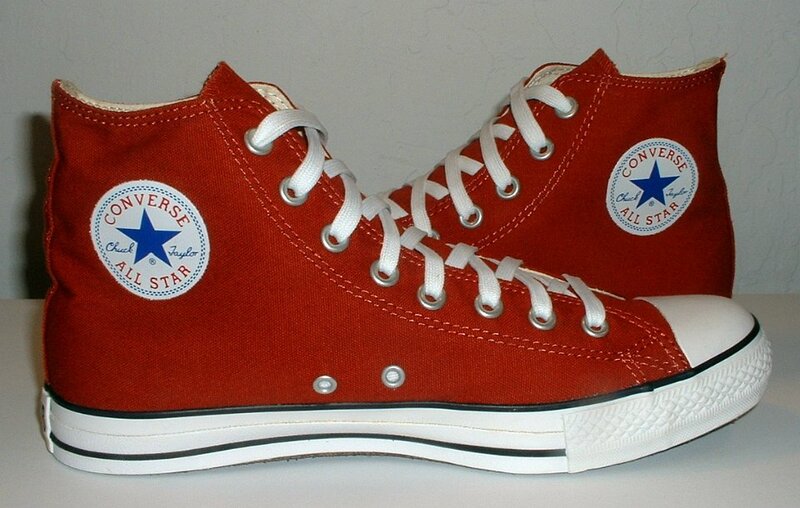 223 Red High Top Chucks Wearing red high top chucks, inside patch views. 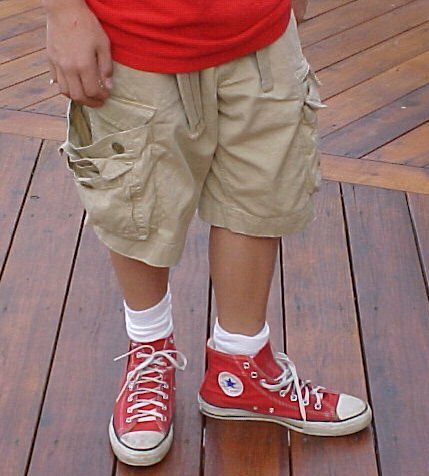 224 Red High Top Chucks Wearing red high top chucks loosely laced. 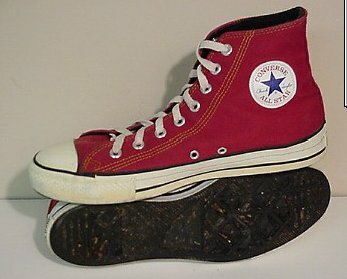 225 Red High Top Chucks Wearing red high top chucks, inside patch views. 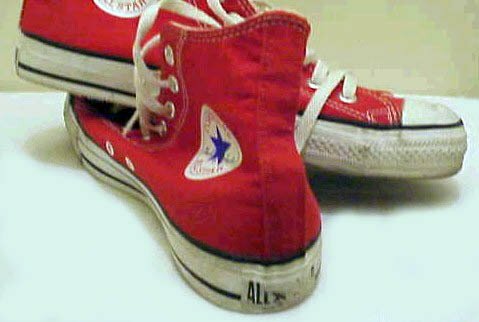 226 Red High Top Chucks Wearing red high top chucks, inside patch views. 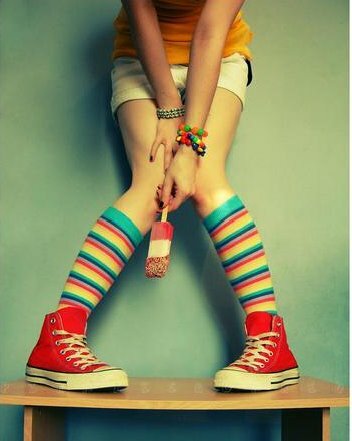 227 Red High Top Chucks Girl wearing red high top chucks with knee high stipred socks. 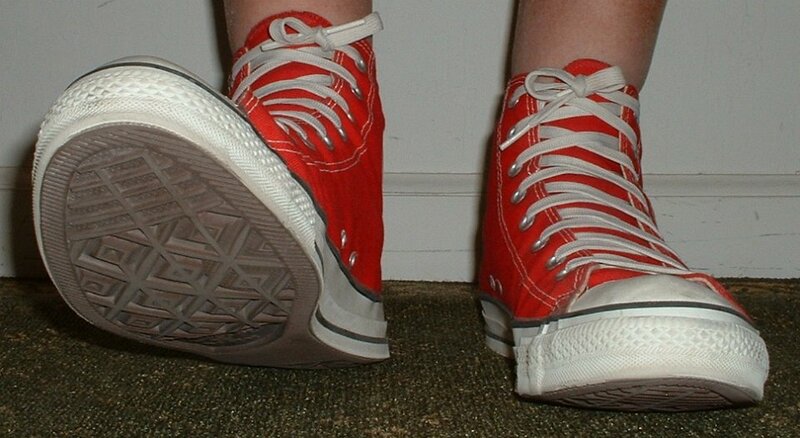 228 Red High Top Chucks Wearing straight laced red high tops, top view. 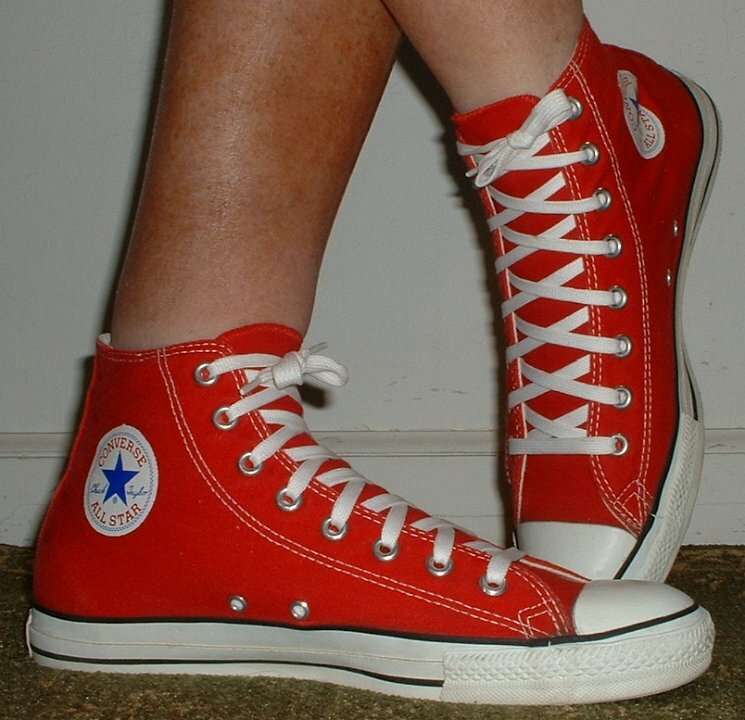 229 Red High Top Chucks Wearing red high top and low cut chucks. 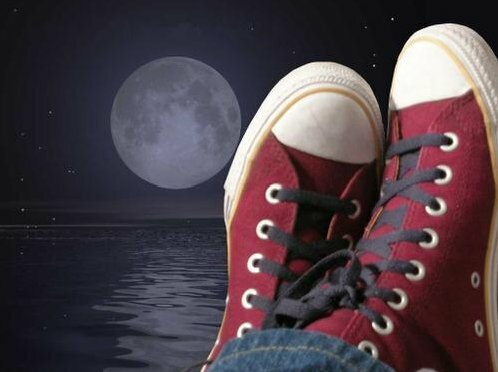 230 Red High Top Chucks Shot of a left red high top chuck relaxing outsoors. 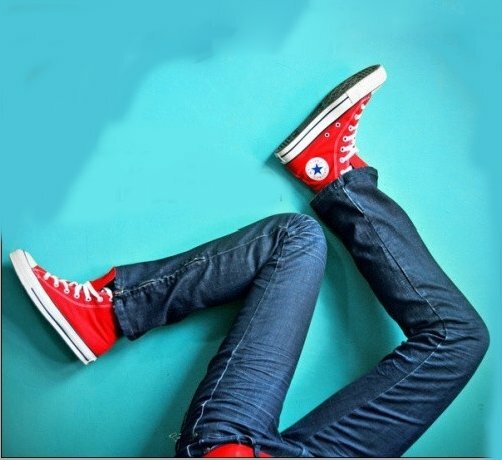 231 Red High Top Chucks Wearing red high top chucks, legs crossed. 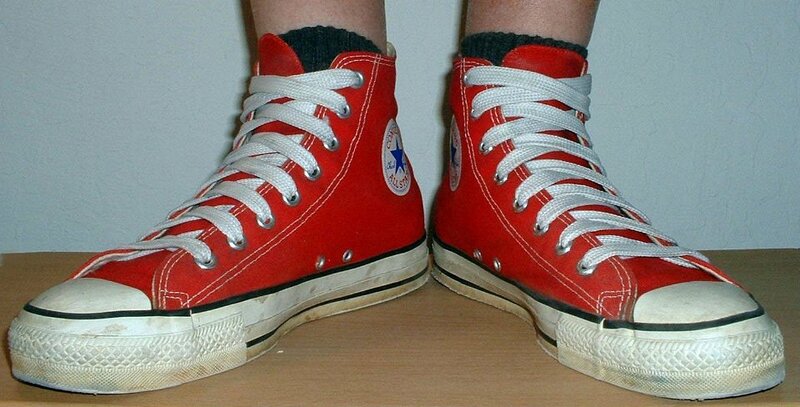 232 Red High Top Chucks Wearing red high top chucks with black shoelaces. 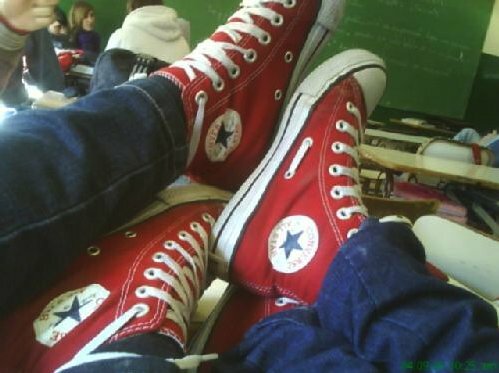 233 Red High Top Chucks Two people comparing their red high top chucks. 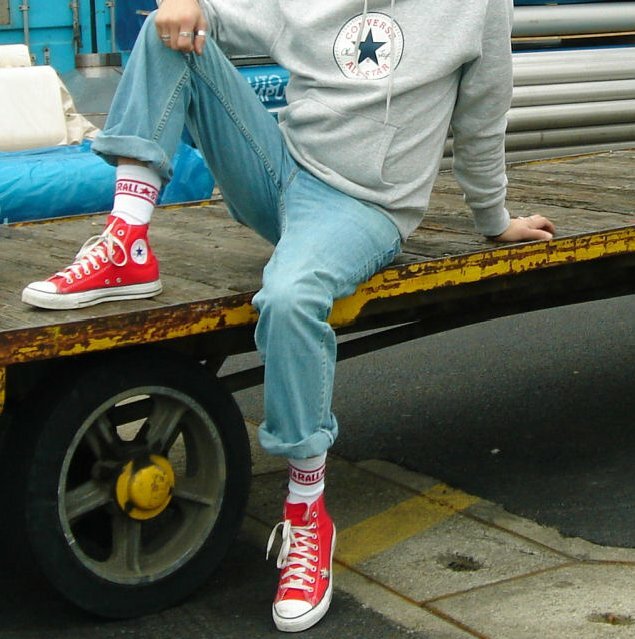 234 Red High Top Chucks Wearing red high top chucks while seated on a truck bed. 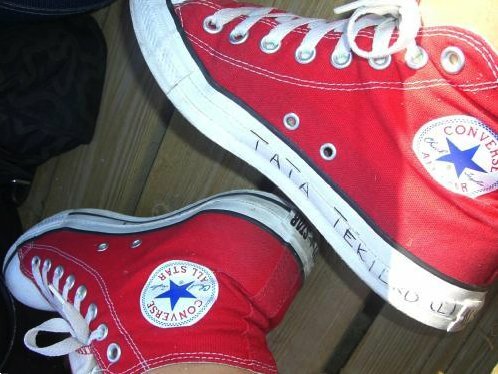 235 Red High Top Chucks Wearing red high tops, front and top views. 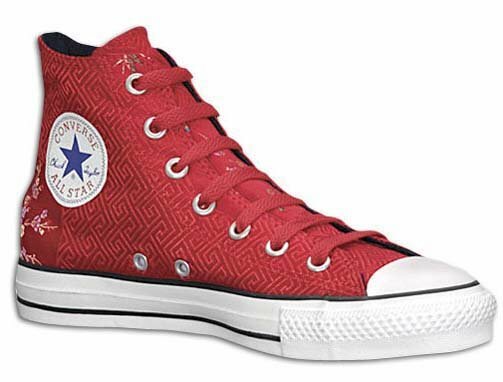 236 Red High Top Chucks Comparing red high top chucks to canvas print low cut chucks. 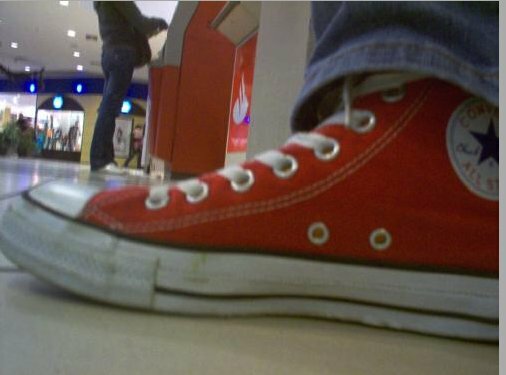 237 Red High Top Chucks Wearing red high top chucks in a mall. 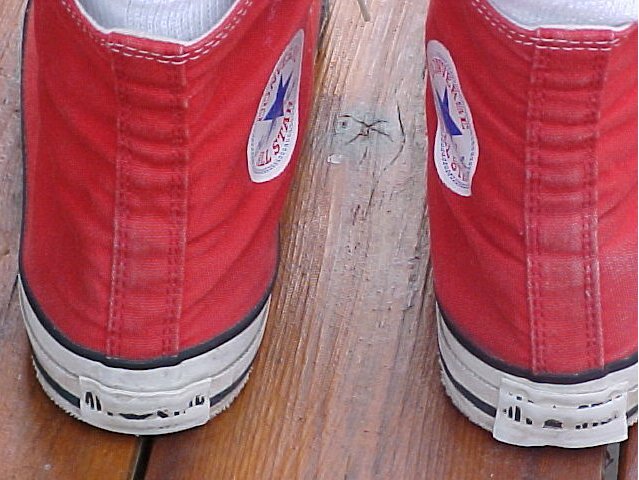 238 Red High Top Chucks Wearing a left red high top chuck, closeup of the inside patch. 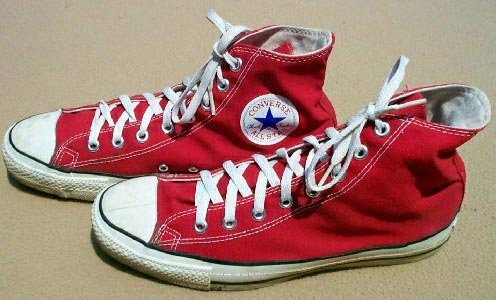 239 Red High Top Chucks Comparing a red high top chuck with red shoelaces to a laser white high top. 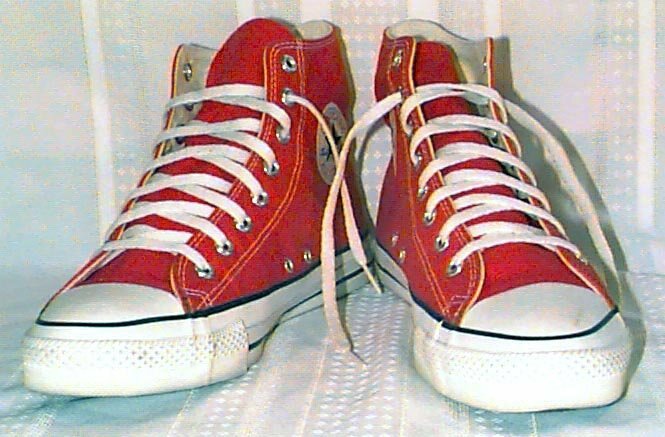 240 Red High Top Chucks Wearing made in USA red high tops, left side view. 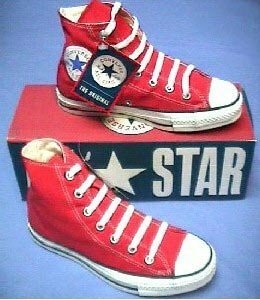 241 Red High Top Chucks Wearing made in USA red high tops, front view shot 2. 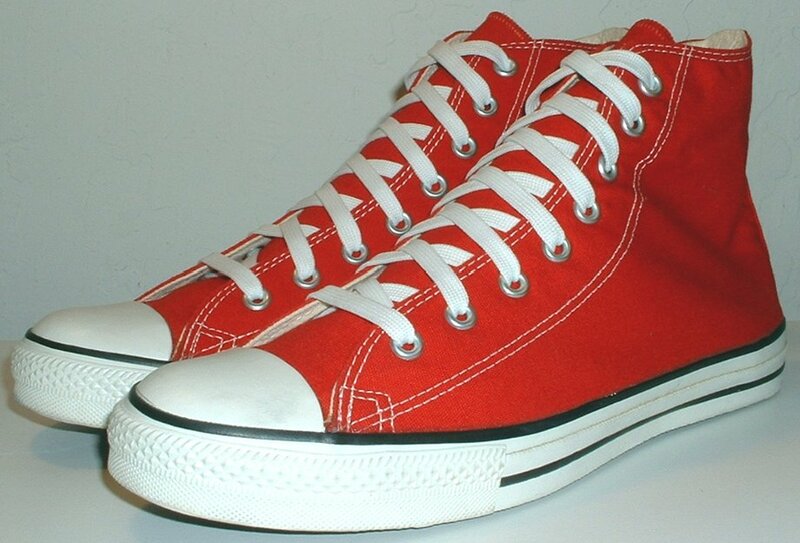 242 Red High Top Chucks Wearing made in USA red high tops, front view shot 3. 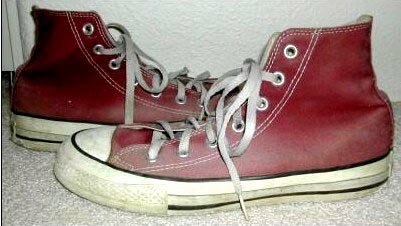 243 Red High Top Chucks Wearing made in USA red high tops, right side view. 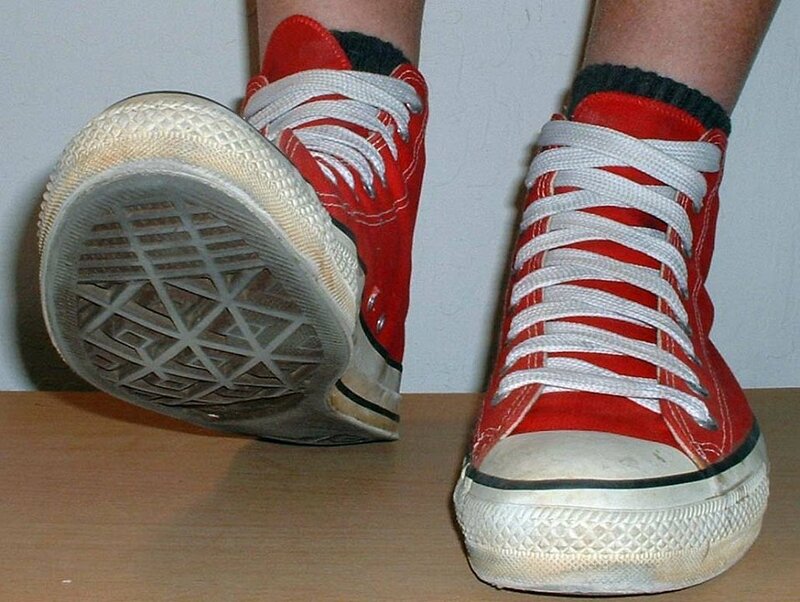 244 Red High Top Chucks Wearing made in USA red high tops, rear view. 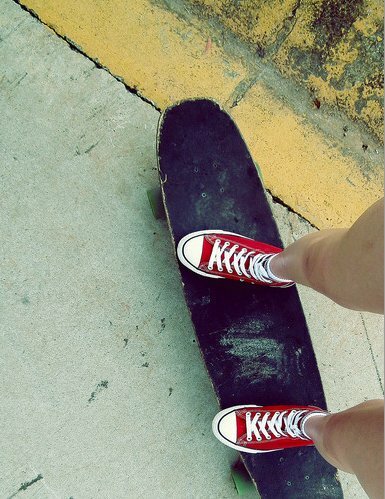 245 Red High Top Chucks Skateboarder wearing red high top chucks. 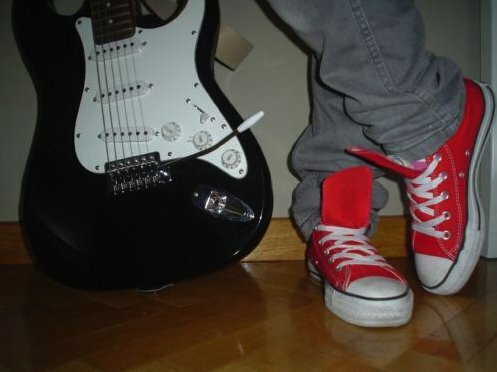 247 Red High Top Chucks Guitarist sporting his pair of red high top chucks. 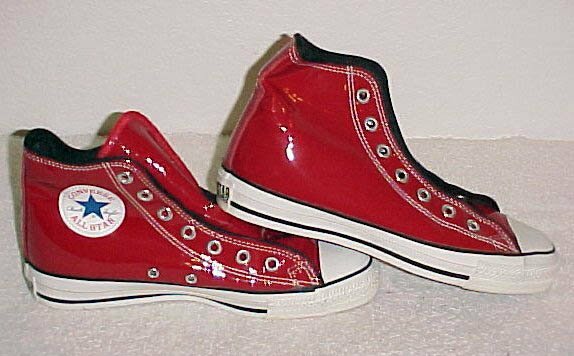 248 Red High Top Chucks Wearing red vinyl high top chucks, front and side views. 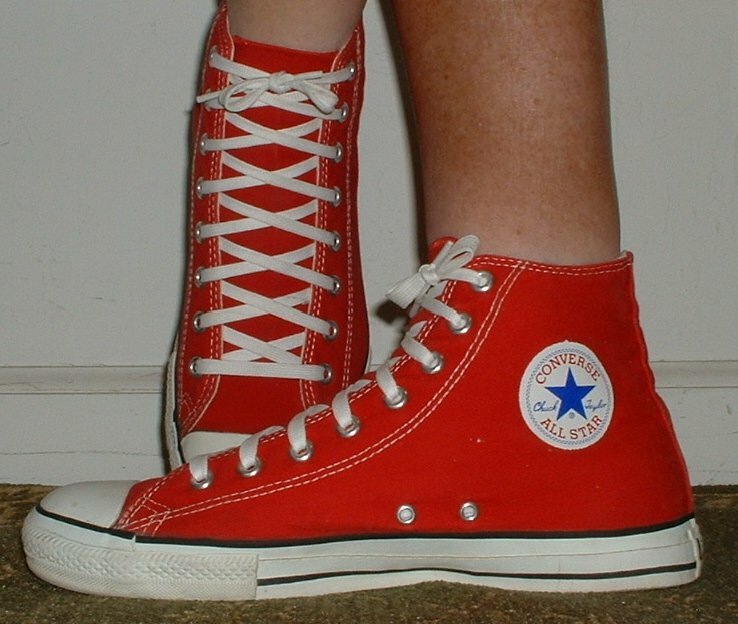 249 Red High Top Chucks Wearing red high tops with wide laces, angled side view. 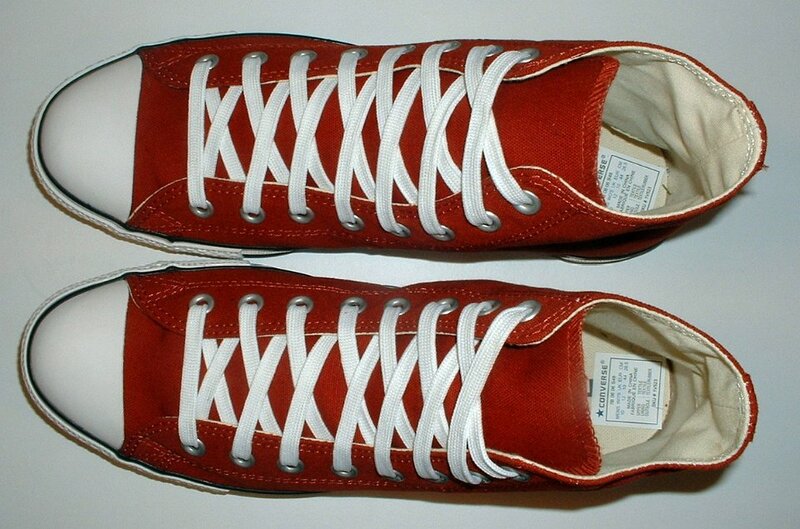 250 Red High Top Chucks Stepping in red high tops with wide laces, front view. 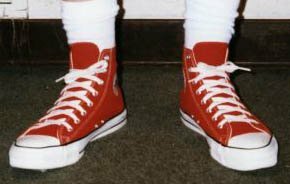 251 Red High Top Chucks Stepping in red high tops, rear view. 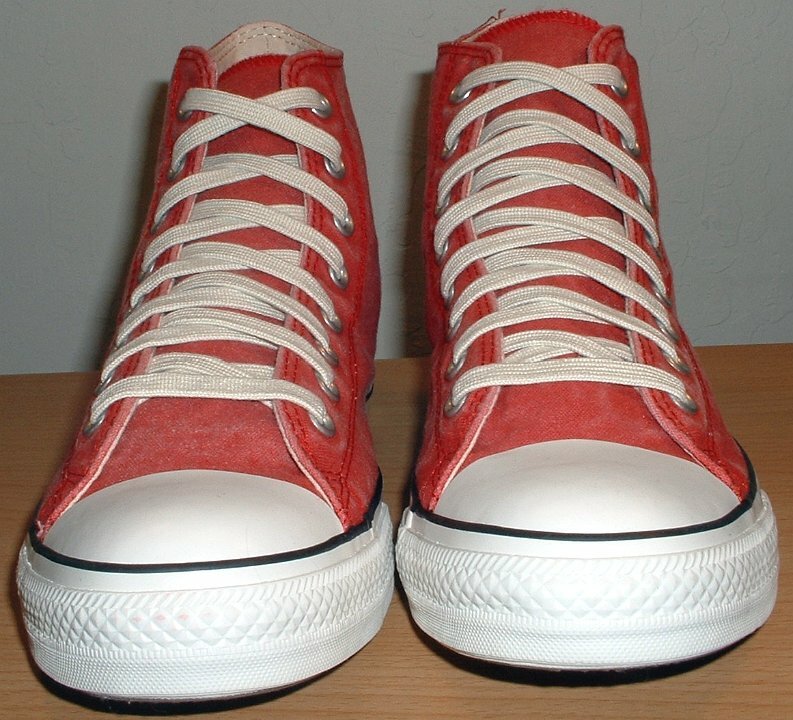 252 Red High Top Chucks Wearing red high tops with wide laces, angled front view. 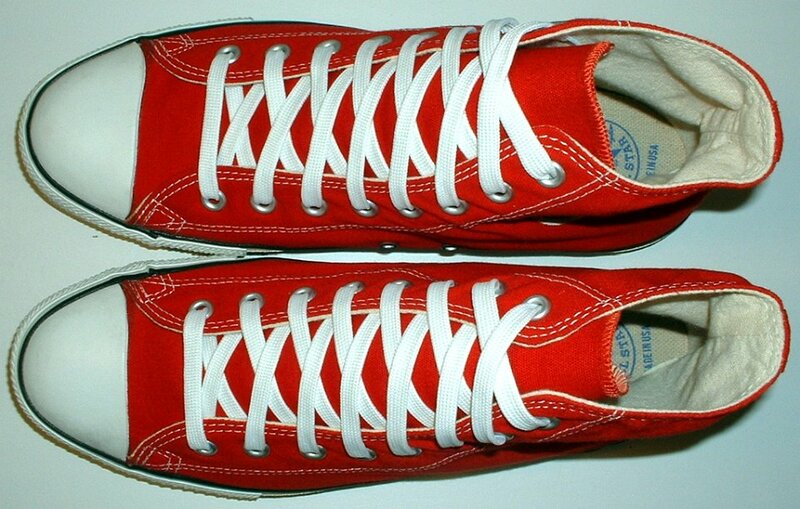 253 Red High Top Chucks Stepping in red high tops with wide laces, front view. 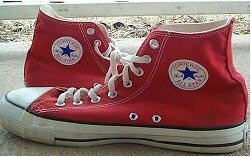 254 Red High Top Chucks Stepping in red high tops with wide laces, front view. 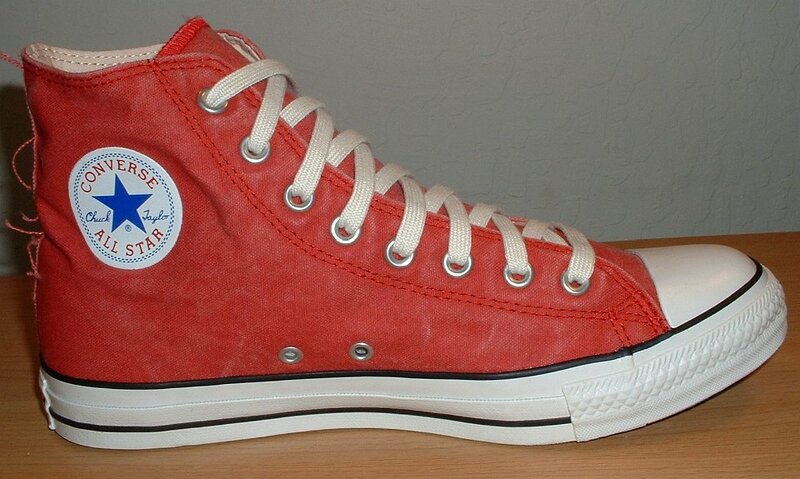 255 Red High Top Chucks Taking a step in a right red high top, inside patch view. 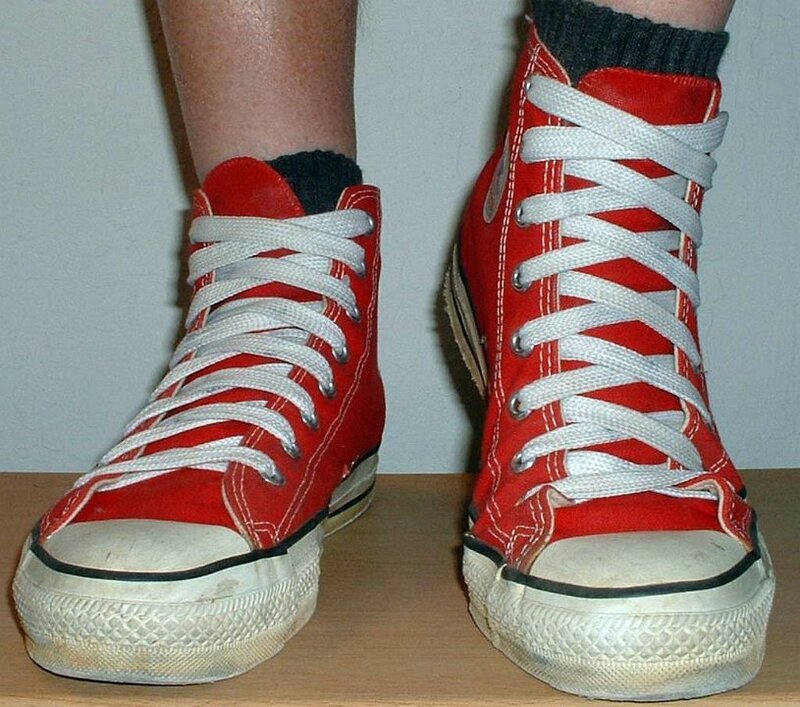 256 Red High Top Chucks Stepping in red high tops with wide laces, left outside view. 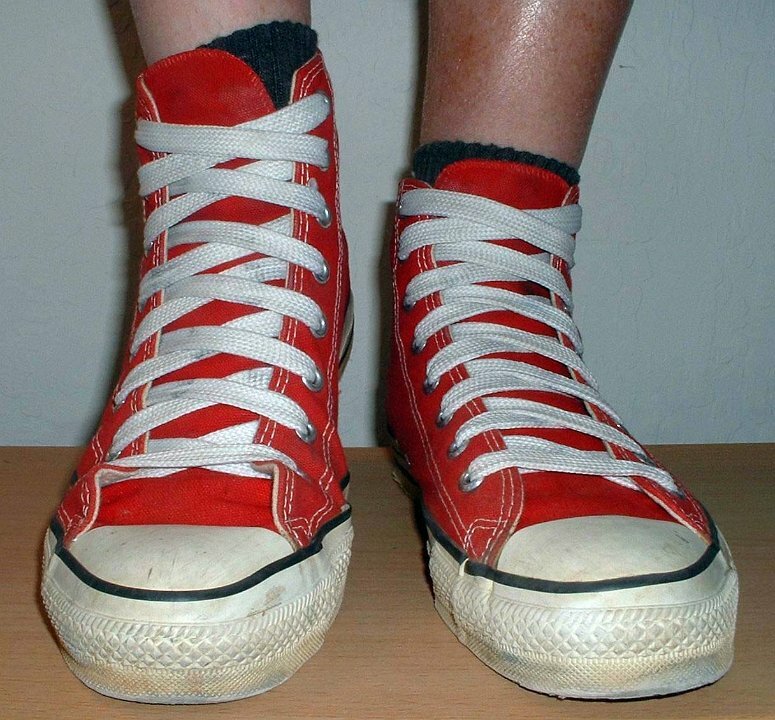 257 Red High Top Chucks Stepping out in red high tops with wide laces, front view. 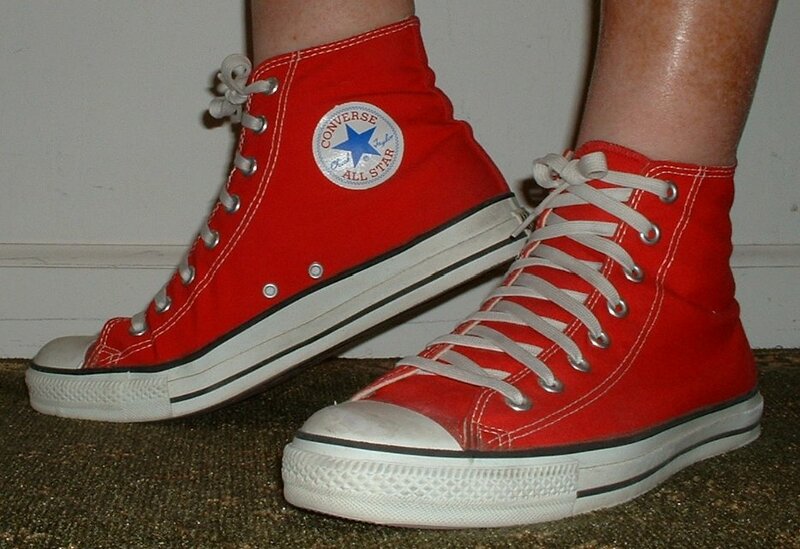 258 Red High Top Chucks Stepping out in red high tops with wide laces, front view 2. 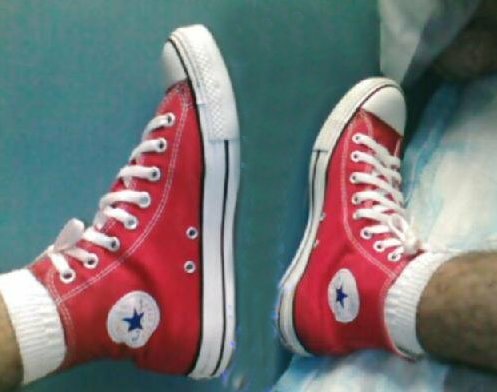 259 Red High Top Chucks Stepping out in red high tops with wide laces, front view 3. 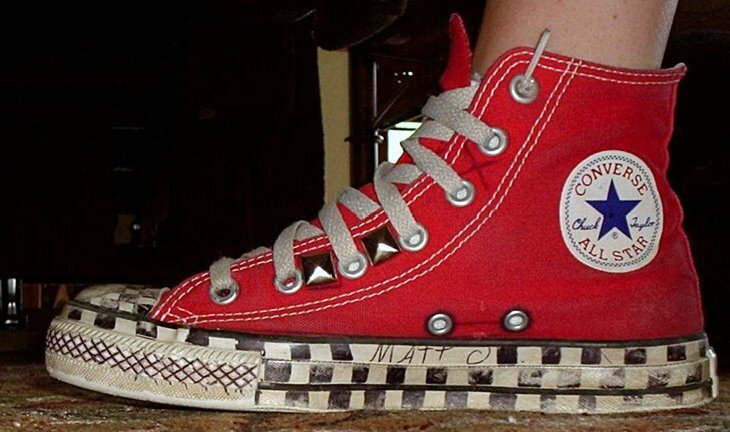 This gallery shows dozens of pictures of core red high top chucks, seasonal variations of the shoes, and shots of red high top chucks being worn. 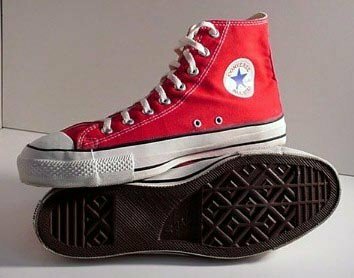 In 2011 Converse announced that the core red high top would be issued as a product red Chuck Taylor shoe.